The Commander of Sahwa in Qarma says modern weapons have arrived there, in preparation for its complete liberation from Daesh. He also says Iraqi security forces are implementing a large search operation in the freed areas in Qarma. The Commander says tribal fighters and PMFs in this proactive campaign have killed 40 Daesh terrorists including foreigners. A source in Anbar Police Command says Iraqi security forces supported by the PMFs launched a military campaign to clear the Jubba area in Haditha District, killing dozens of Daesh terrorists. A Major in Anbar Operations Command says 18 Daesh were killed in the operation and 5 vehicles destroyed. Daesh says the attack on Jubba failed and a Sahwa commander was killed. Iraqi MoI says Al-Suqoor Intelligence Cell followed a group of Daesh leaders who fled from military clashes and hid in Al-Qa’im in west Anbar. He says Iraqi Army Aviation bombed the location on Sunday killing 20 terrorists, including well known Iraqi and foreign terrorists. PMFs say Daesh is booby-trapping dead bodies of Iraqi soldiers. In another instance they booby-trapped a living 4-year-old child. DaeshDaily Comment: In the same video a Shia PMF fighter says a Daesh terrorist called him on his mobile and told him they would burn his brother’s body. The fighter asked him who he was and the terrorist said he was from the Dulaim tribe (Anbar’s dominant Sunni tribe). The fighter told him that many Dulaimis are living safely in Baghdad and the terrorist replied “That’s because you are not real men. You should kill them”. This story shows that Daesh is still depending on the old strategy followed by Zarqawi (Attack the Shia, the Shia retaliate, more Sunnis join the terrorists). It is a simple strategy but unfortunately the Iraqi government has not yet found a way to defeat it. The MoI says 450 fighters graduated from Anbar Police’s Emergency Regiment’s 21-day military training. The Ministry says this is the 12th graduated group so far. A security source says Iraqi forces and tribal fighters attacked Daesh locations in Khasfa near Haditha. Daesh says it stopped the attack in Khasfa and destroyed 3 Iraqi army vehicles and killed many soldiers and tribal fighters. The Association of Muslim Scholars (an anti-Iraqi government Sunni organization) issued a statement repudiating the burning of civilian houses by Shia militias in Nukhaib. DaeshDaily Comment: The Association was one of the first supporters of the Sadrist militias when they were created in 2003 as an anti-Coalition organization, and became known primarily as a mouthpiece for the insurgency. Despite the name, there is nothing scholarly about its public statements. Daesh publishes photos of shelling the Iraqi forces in Anabr. And photos of executing a “spy” in Khaldiya. And a video about “spies” in Anabr. Daesh raises a big flag in Falluja. A PMFs official says a joint Iraqi security force supported by the PMFs clashed with Daesh near Al-Allas oil field, killing a Daesh leader called Abu Ikrima, from Chechnya, and 2 other terrorists. A source in Salahuddin Operations Command says Iraqi forces launched an attack on Daesh in Baiji yesterday and killed 9. He says there was no significant resistance and the terrorists withdrew to the north and are now trapped near the refinery. A PMF fighter removes Daesh flag from a 60 m tower. Iraqi MoI says Iraqi security forces disassembled 17 booby-trapped houses in west Baiji. Daesh publishes a photo of the Moroccan terrorists who attacked the Iraqi forces with a car bomb in Baiji. Daesh says it still controls most of Baiji. Iraqi Federal Police Commander says Iraqi forces captured the residential compound at Baiji Refinery and the main roads around it. Daesh publishes photos of Ramadan activities in Shirqat. And more flags. A police source says 2 IEDs exploded on the roadside in Al-Mada’in in south Baghdad, injuring 4 civilians. A security source says an IED exploded near a meat market in Mada’in, killing one civilian and injuring 4. An MoI source says an IED exploded in a trade area in Rashdiya in north Baghdad, killing one civilian and injuring 8. A security source says an Iraqi soldier was killed and 3 injured when an IED exploded on their patrol in Taji in north Baghdad. A security source says a civilian was killed when a sticker IED exploded on his car in Ghazaliya in west Baghdad. Police sources say an IED exploded in Mahmudiya in south Baghdad, killing 3 civilians and injuring 10. An MoI source says an IED exploded near a soccer field in Hay Al-Wihda in south Baghdad, killing one civilian and injuring 6. The Speaker of the Iraqi Parliament says Iraqi tribes have an important role, not only to fight Daesh but also to “heal the rift” between parts of Iraqi society. DaeshDaily Comment: In 2003 the tribal structure in Iraq was heavily damaged because the new political system didn’t pay a lot of attention to the actual composition of Iraqi communities. Everyone was talking about Iraqis as Sunni, Shia, Kurdish, etc. without paying much attention to the actual community structure and leadership. Tribal leaders, not only Sunnis, were ignored or pushed aside by the new political/religious movements and that made a real national dialogue on the community level difficult. Daesh, and the Baathists, paid attention to this and filled the gap that was created by the absence of “real” Sunni tribal leaders in Sunni areas. Most of the leaders left the country and new faces appeared, some with and some against the Iraqi government. A successful reconciliation process in Iraq must go beyond the politicians and include the participation of all prominent tribal leaders. Iraqi Armed Forces Chief of Staff Babkr Zebari, a Kurd, says he requested to retire, and that it was not an order from PM Abadi. He says he wanted to retire several times but KRG President Barzani kept asking him to stay. The position is held by a Kurd because of existing political agreements. A security source says an IED exploded near Muqdadiya courthouse northeast of Baquba killing one civilian and injuring 3. A security source says a colonel in the Iraqi army was injured when unknown men threw a hand grenade at his house in south Kirkuk. Daesh publishes a video of one of their suicide terrorists and say he stopped the Iraqi forces’ attack on Basheer village. Daesh publishes a photo of one of its Kurdish leaders, Mullah Shwan, who had been reported killed by a coalition airstrike. A source in the PMF says General Abdul Rahman Al-Jubouri was appointed commander of Ninewa PMFs. He also says the General will be working with Salahuddin PMF Commander Asham Al-Jubouri (same tribe but not related). He says Mosul liberation will start in Baiji, then go to Shirqat. DaeshDaily comment: This has been stated by others too, but Iraqi forces have so far been unable to clear Baiji completely in order to move on. It seems clear that both sides value Baiji for its strategic location as well as its oil. Daesh says it established more checkpoints in Qayyarah south of Mosul. Daesh publishes photos of confiscating and burning tobacco products in Ninewa. DaeshDaily comment: How did Daesh become Iraq’s anti-smoking advocate? The Appeals Court in Basra says Al-Suqoor Intelligence Cell arrested the terrorist responsible for the suicide attack last month in Safwan, on the Kuwait border. The Court says the terrorist is a truck driver from Mahmudiya in south Baghdad. The Governor of Dhi Qar says people in 35 villages in Dhi Qar have left their houses because of the lack of water caused by the low levels in the Euphrates River. The Spokesman of the Turkish President says the deployment of the Turkish forces to the Syrian borders is only to secure those borders. He says that any speculations that the Turkey will participate in the war in Syria are “illogical”. Turkish media outlets drew a map of the “separation area” Turkey intends to create along the border with Syria. Local Kurdish Administration in Kobane accuses the Syrian Coalition and the Turkish government of helping Daesh terrorists attack Kobane on Thursday. A Kurdish official in Kobane says around 20 Daesh terrorists are still on the loose in Kobane. Local activists say the Kurdish forces clashed heavily with Daesh “sleeper cells” in Tal Abyad, who retreated into a school. They say Daesh terrorists entered the city with the civilian returnees from Turkey. Syrian TV says government forces recaptured Al-Guwairan in east Hasaka from Daesh. Daesh says one of its terrorists attacked the Syrian regime’s Air Force Intelligence headquarters east of Homs with a car bomb, killing 20 Syrian soldiers. Daesh publishes photos of shelling the Syrian army and Hezbollah in Qalmoon. Daesh public executions in Deir Al-Zor. A collection of Daesh publications. Daesh issues a message to the people of Gaza. Daesh issues a message to the people of Jerusalem. Anbar GC asks PM Abadi to fire “undisciplined” members of the PMFs who raided a house of a tribal leader in Khalediya and insulted him. The GC says the tribal leader is one of the members of the anti-Daesh tribal coalition in Anbar. Local sources say Shia militias burned the house of a Sunni tribal leader in Nukhaib. Anbar GC says the militias burned dozens of houses in Nukhaib and asks PM Abadi to quickly open an investigation. A security source says Iraqi forces liberated Al-Abbadi Road east of Ramadi after clashes with Daesh, and defused 45 IEDs in the process. A Sahwa Commander from Falluja says Iraqi Army Aviation, based on precise intelligence information, bombed Daesh locations in several areas in Falluja, killing 22 terrorists and injuring 18. He says (perhaps implausibly) that some of the slain terrorists were from Korea. The MoI says the Iraqi Air Force, in coordination with the Ministry’s Al-Suqour Intelligence Cell, launched an airstrike on a Daesh location in Al-Qa’im in western Anbar, killing 20, including both Iraqi and foreign leaders. The MoD estimates 30 Daesh were killed there in joint airstrikes between the IAF and the IAA (Iraqi Army Aviation). DaeshDaily Comment: The IAA is mostly an Army helicopter unit that usually operates separately from the IAF. A source in Anbar Police Command says the security forces found a mass grave of 22 Iraqi policemen in Qarma, east of Falluja. Anbar Operations Commander says Iraqi forces supported by Coalition airpower killed 16 Daesh fighters east of Ramadi. Iraqi MoD says Baghdad Operations Command attacked in several areas in Anbar, killing 13 terrorists and destroying vehicles and IEDs. Iraqi Federal Police Commander says Daesh executed 30 of its own men in Ramadi and Falluja, accusing them of giving information to the Iraqi forces. Daesh says it rehabilitated the general hospital in Ramadi. And publishes photos of the market in the city. A provincial government source in Salahuddin says 3,000 families have returned to their houses in Tikrit so far. A security source says the Iraqi Army’s 34th Armored Brigade destroyed 2 Daesh vehicles and killed 11 terrorists in Baiji center. Kata’eb Hezbollah said earlier today the second stage of Baiji liberation operations has started. The Commander of the Iraqi Army’s Rapid Intervention Division says 60 Daesh terrorists were killed and 5 foreign terrorist arrested today in a military operation in Baiji. Asa’eb Ahl Al-Haq says Daesh “pockets” in Baiji were cleared completely. Dijla Operations Commander says Daesh suffers sharp conflicts between its leaders, which lead to internal executions. He also says Daesh is resorting to IEDs instead of direct attacks on the Iraqi forces in Salahuddin. He says 15 Daesh leaders were killed during the last few weeks in Baiji. The Spokesman of the PMFs says Baiji Refinery will be liberated completely in the next few days. He says some Daesh snipers are still in the refinery. Kata’eb Hezbollah says it had heavy fights with Daesh in the Hawi area between Baghdad and Tikrit, which is its last line of defense in this area. Dijla Operations Commander says the Iraqi forces stopped a Daesh attack on Al-Allas and Ajil oil fields east of Salahuddin, killing 11 and destroying one vehicle. The MoD says IAA destroyed 2 vehicles trying to attack Iraqi forces at the former Speicher base and killed 4 terrorists. The MoD also says it destroyed a tank bomb in Khuzaimi, killing 6 terrorists. The MoI says Iraqi Federal Police supported by the PMFs stopped a Daesh attack near Himrin Hills, killing many of them and destroying their vehicles. Notwithstanding its defeats in the province, Daesh raises its flag in an unannounced location in Salahuddin. An MoI source says an IED exploded near shops in Hay Al-Turath in south Baghdad, killing one civilian and injuring 8. The Chairman of the Sunni Endowment (the highest official Sunni organization) says the conflicts between Iraqi Sunni leaders made Daesh stronger. He also says the Sunni politicians are not the real representatives of Sunni Iraqis. DaeshDaily Comment: The sense of misrepresentation is not only a Sunni thing. Many Iraqis from all sects and ethnic groups believe they are not represented well in the political system. The parliament hires and fires the PM and approves the ministers, and many people think they have no real voice there. PM Abadi orders the military and security commanders not to give any statement about the security situation outside the recently formed War Media Cell, formed recently to coordinate military messages to the public. An MP from the major Sunni Bloc in the Iraqi Parliament says they have no knowledge of a conference in Turkey for Sunni tribes. They also say the Iraqi government didn’t respond to their demands regarding arming Sunni tribes, and that they have many options including establishing a Sunni region. The Spokesman of the Iraqi Judicial Council says 28 suspects in the Speicher Massacre will go on trial on July 8th in the Central Criminal Court. Baghdad Operations Command says it killed and arrested several Daesh terrorists and confiscated weapons and explosives in several areas in Baghdad. A security source says a civilian was killed and 3 injured when a sticker IED exploded in a small bus in Husseiniya in north Baghdad. A security source says a sticker IED exploded on an Iraqi Ministry of Oil’s employee in Baladiyat in east Baghdad killing him instantly. A security source says an IED exploded in Bakriya area in west Baghdad killing one civilian and injuring 5. A security source says an IED exploded in Rasheed area in south Baghdad killing 2 and injuring 8. A source in the Iraqi Police says unknown armed men shot and killed a local Sunni PMF Commander while he was driving in Tarmiya in north Baghdad. The source says another PMF fighter was killed in the attack and 2 injured. Daesh claimed responsibility and said the Commander was a Shia. DaeshDaily Comment: It’s obvious from the name the Commander was a Sunni from the Mishahda tribe. A security source says 2 policemen were killed and 3 injured when a roadside IED exploded on their patrol in northeast Baquba. The Governor of Diyala says the displaced families should return to their houses in Jalawla and Saadiya as soon as possible; they were liberated from Daesh months ago. He also says the PMFs should hold the ground in these areas. There are disputes and mutual accusations in these areas between the PMFs and the Peshmerga. The MoI says Iraqi Army Aviation launched airstrikes on Daesh in Sufra village between Hawija and Himrin. Kirkuk Governor says Peshmerga soldiers killed a suicide bomber and destroyed his car bomb as he was trying to attack them in the Arafa area. A security source says the car bomber was trying to attack a Shia mosque in the area but PUK fighters shot and destroyed the vehicle before it reached the mosque. A security source says 3 civilians were injured when an IED exploded in Rashad 30 km southwest of Kirkuk. Daesh publishes photos of its terrorists in Rashad. Daesh publishes a video of its training camp in Kirkuk. And photos of the local market in Hawija. A medical source in Suleimaniya says 2 children from Ninewa died from the heat in a displaced people camp. He also says the diseases spread widely in the camps because of the sudden shortage of medical supplies. Photos of the displaced families in Kurdistan. A report about Mosul families fleeing to Turkey through Syria. A Kurdish MP says there are 6,000 Yazidi refugees living in a difficult situation in Bulgaria. The KRG says 40,000 Yazidis have left Iraq since June 2014. He says the Yazidi refugees in Turkey are fleeing to Europe through Bulgaria after Daesh’s recent attacks in Kobane. Kata’eb Al-Mosul says it targeted a Daesh “police” car in the Bazwaya area of in Mosul with an IED, killing 4 of them. Daesh issues new IDs for its fighters in Mosul. An MoI source says the Coalition, based on information from Iraqi Intelligence, bombed a Daesh convoy filled with weapons and ammunition, trying to leave a training camp in Tal Afar. The PMFs say a Mosul Liberations Operations Room was established today by the Iraqi security forces, the PMFs and “the sons of Mosul”. A member of the security committee in Ninewa GC says Ninewa Liberation Operations will start after Ramadan and the PMFs will participate in it. A Kurdish official says Daesh executed Baghdadi’s rep in Mosul, Othman Abu Hassan, accusing him of treason. Peshmerga sources say they shelled Daesh locations in Kassak west of Mosul with heavy artillery on Sunday, killing 13 terrorists, in coordination with the Coalition. Daesh publishes a video and photos of shelling the Peshmerga in Telesgof, in the largely Christian area east of Mosul. A Peshmerga source says the Coalition launched an airstrike on Daesh in Al-Quawir, east of Mosul, killing an “emir” called Mohammed Ahmed Faris and 30 other terrorists. A security source says the Coalition launched an airstrike on Daesh’s information office in Dawasa in downtown Mosul, killing a Daesh information officer and 3 of his associates. Ninewa Operations Command warns the people of Mosul that Daesh created fake Facebook pages pretending they represent local resistance in Mosul, in order to catch people who provide information and news. A Shabak member of Ninewa GC says Daesh moved thousands of Arab families from areas around Mosul to the Shabak areas in Ninewa Valley in order to create a defense line against any potential attacks. A Kurdish official says Daesh brought 400 Arab families from Baiji and Ramadi to a residential compound in Ninewa Valley. Daesh road work in Mosul. Daesh publishes a video of its terrorists in Ninewa. The Security committee in Basra GC says the security forces arrested dozens of people claiming to be members of the PMFs. The Committee says some of these people have weapons, uniforms, badges, cars and even have their own headquarters. DaeshDaily Comment: The PMFs became a prestigious and profitable business in Iraq. Having a PMF badge or ID will open many doors for you and will intimidate civilians, and even security officers. The Iraqi government needs to look at this problem more thoroughly. The Security Committee in Basra says security forces in Basra arrested a terrorist cell called Jund Allah in Abu Al-Khaseeb in south Basra. The Committee says the cell was focusing on recruiting “misguided” people from “both sects” and displaced people. The Director of the KRG’s Asayesh in Erbil says his forces arrested the brother-in-law of the Emir of the Islamic Group in Kurdistan accusing him of terrorism. IG is represented in the KRG parliament. Turkey deploys soldiers and tanks on the borders with Syria. Turkish media says the government will send 18,000 soldiers to northern Syria. The Syrian Observatory for Human Rights says Daesh has executed 3,027 people in Syria since June 2014. The Observatory also says Daesh female members have disappeared almost completely from Raqqa streets. Assyrian sources say 1,300 Christian families left their houses in Hasaka and headed north to Qamishli. 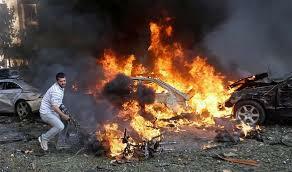 Twelve Syrian regime soldiers were killed in 3 car bomb attacks in Hasaka. Daesh publishes a video of the clashes in Hasaka that ended with them capturing the sports compound in the city. Photos of the YPG fighters in Hasaka. Local activists in Hasaka say the fights between Daesh and the YPG stopped after the Kurdish forces took over Al-Aziziya and Al-Ghazl areas. They also say the Kurdish forces in Jazeera sent reinforcements to Hasaka. A report and a video of the destruction in Kobane after the Daesh attack. Kurdish forces say they stopped Daesh attacks in Hasaka, Kobane, and Tal Abyad. The Syrian Kurdish security forces, Asayesh, issues a night curfew in Kobane. Daesh publishes photos of the results of the airstrikes on Aleppo and Tadmur, which it blames on the Christians. Daesh says it shot down a Syrian government jet in Deir Al-Zor. Daesh road repairs in Raqqa. The Saudi Ministry of Interior says the terrorist who attacked the Shia mosque in Kuwait on Monday flew to Bahrain, using Gulf Air, and then went from there to Kuwait. Kuwaiti Council of Ministers says the cell linked to the terrorist confessed they brought the explosives used in the attack by car from Saudi Arabia three days earlier. They said they received orders from Daesh to execute the operations and they “didn’t have the right to discuss the orders”. Daesh issues a pre-recorded audio statement by the terrorist. The Islamic Cooperation Organization repudiates the terrorist attacks in Kuwait, France and Tunisia. DaeshDaily Comment: It is interesting to notice that the Organization had previously been reluctant to criticize the terrorist attacks in Iraq. A report about Daesh leaders in Iraq and Syria. Daesh says it detonated a car bomb on the Huthis near the military hospital in Sanaa, killing and injuring many of them. Daesh raises its flags in Sirte’s entrance in Libya. And publishes a video of the clashes with the Libyan forces in Burqa. And raises their flag in Libyan army posts. Daesh publishes a video about killing judges in Egypt. The leader of Sahwa in Qarma says farmers in Qarma celebrated the marketing their wheat corps to the Iraqi government’s silos for the first time since Daesh took over the area. DaeshDaily Comment: Iraqi government buys the grain harvest from farmers for subsidized prices. The Mayor of Al-Rahaliya subdistrict, 90 km south of Ramadi, says there 2,000 displaced families under miserable conditions in the subdistrict and asks the government to support them. The leader of West Anbar Sahwa says 16 Daesh suicide bombers took advantage of the low water level in the Euphrates and crossed to the residential compound in Al-Baghdadi but the Iraqi forces supported by fighters from Albu Mahal and Albu Nimir stooped the attack and killed all terrorists. Other sources say Daesh attacked the compound with 2 car bombs killing 2 soldiers and injuring 4. Baghdad Operations Command says Iraqi security forces, tribal fighters and PMFS supported by the Iraqi Air Force and the Coalition airpower killed 48 Daesh terrorists and destroyed 16 of their locations and 11 vehicles in military operations in Qarma. 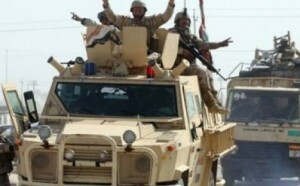 A source in Anbar Operations Command says Iraqi forces stopped an attack on Qarma, killing 5 terrorists. A source in Anbar police says Iraqi forces shelled a house used by Daesh terrorists to launch mortar attacks in Hsaiba east of Ramadi killing 5 terrorists. The Spokesman of the Iraqi Ministry of Interior says Anbar Police Command is implementing the Minister’s plan to turn Ramadi police to 6 emergency combat regiments. He says these regiments are in advanced stage of training in order to participate in Anbar liberation battles. He also says Anbar police arrested 40 Daesh sleeping cells members in Ameriyat Al-Falluja, Habbaniya and Khalediya. He says the suspects confessed about their plans to commit terrorist activities. A security source says 10 Daesh terrorists were killed and dozens injured in an Iraqi Army Aviation airstrikes on Malahma area southeast of Falluja. The Commander of the Local PMFs in Anbar says the PMFS from Ramadi tribes were armed with light and mid-size weapons and will participate in Anbar liberation battles alongside the Iraqi Army, Police and PMFs from other areas. The Spokesman of the PMFs says Ramadi and Falluja are completely surrounded by Iraqi forces. He also says he will not give a timeline for the start of the liberation operations. Daesh publishes photos of the public execution of 2 PMFs “spies” in Anbar. Daesh publishes photos of armoring vehicles in Falluja. An official in Diyala PMFs says Iraqi security forces supported by the PMFs implemented an operation west of Baiji killing Daesh main explosives expert, Abu Muslim Al-Caucasi. He says the terrorist was responsible for Daesh’s biggest car bomb factory in Salahuddin that was raided earlier by Iraqi forces. Dijla Operations Commander says the Iraq forces killed hundreds of Daesh terrorists from 53 countries in Diyala and Salahuddin during the last few months. He also says Daesh continues its attacks on the oil fields in north Salahuddin with no success. A security source says Iraqi Army Aviation bombed Daesh in several areas north of Tikrit killing 30 terrorists and destroying weapons and vehicles. The Spokesman of the PMFs says the battle in Baiji was decided and what’s left if to liberate Siniya in order to break the siege on Haditha in Anbar. Daesh says it detonated a house on the Iraqi forces killing 14 of them near the Silo between Samarra and Tikrit. Daesh distributes food items on poor families in Salahuddin. There was no date on the photos. An MoI source says an employee in the Iraqi Ministry of Trade was killed when an IED exploded in his car while passing through Adhamiya in north Baghdad. Another MoI source says one civilian was killed and 4 injured in an IED explosion near a parking lot in Huseiniya in north Baghdad. Iraqi MoD says the body of the Iraqi pilot who was killed when his jet crashed in Arizona in a training mission was found. A Kurdish MP in the Iraqi Parliament says the anti-terrorism conference intended to be held in Baghdad next week should not include only Syria and Iran. He says the conference should include other countries in the region fighting Daesh. A police source says a Sahwa leader and his son were killed and 3 members of their family injured when an IED exploded on their car in Arab Jubour area in south Baghdad. A security source says a civilian was injured when an IED exploded on the roadside in Taji in north Baghdad. A security source says a civilian was killed and 4 injured in an IED explosion in Husseiniya in north Baghdad. A security source says 2 civilians were killed and 7 injured in an IED explosion in Saba’ Al-Bour area in north Baghdad. Iraqi Federal Police Commander says security forces arrested a Daesh Arab terrorist in Baghdad. The terrorists admitted participating in many attacks in Baghdad. Diyala Police Commander says security forces liberated 3 kidnaped men in Al-Udhaim area. The area was a stronghold for Daesh and AQI for years before it was liberated recently. A source in the Iraqi Army Aviation says 35 Daesh terrorists were killed in IAA airstrikes on a Daesh gathering in the police station in Basheer village south of Kirkuk. A security source says Daesh shelled Turkmen PMFs near Basheer village with mortars killing one fighter. A security source says and IED exploded in Touz Khumatu center killing 3 civilians and injuring 5. An official in the KRG says 1,901 Yazidis escaped Daesh prions in Iraq and Syria during the last 10 months. A PUK official says Daesh executed on Wednesday 7 former police officers in Mosul months after they announced their “repentance”. Eyewitnesses say Daesh turned the popular market in Bab Al-Tob in downtown Mosul into a public executions area. Daesh says it electrified some of its prisoners in revenge for the Coalition airstrikes on Mosul with electro-magnetic bombs. A source in the Iraqi National Security Service says 13 terrorists were arrested while having a meeting in Diwaniya. The source didn’t say if the terrorists were linked to Daesh. DaeshDaily Comment: Most likely these terrorists are linked to Sarkhi, a radical Shia cleric who was accused of having links to the Baathists and Sunni armed groups and responsible for many attacks on the Iraqi forces and the Coalition in the south. Kobane residents take shelter in the woods fearing another Daesh attack. Rudaw TV reporter in Kobane says Daesh terrorists are still in control of Mashtnour hospital and 3 other nearby areas. He also says the YPG surrounded the hospital after killing 35 terrorists. The manager of the Kurdistan Red Crescent says Daesh took 50 citizens hostages in the hospital. He says 150 civilians were killed and 300 injured. He says the 5 foreign MSF doctors are fine including the American Christina. A video of the fights in Kobane. Turkish president Erdogan condemns the attack and says Turkey has nothing to do with it. Local sources in Kobane say they identified 65 people killed by Daesh in Kobane so far. Daesh says it took over large parts of Kobane. Daesh publishes a video of the suicide bombers. Photos of Daesh attack on Hasaka. Rudaw TV says Syrian regimes jets bombed Daesh locations in the southern countryside of Hasaka. Daesh took over Al-Humr area, 3 km from Hasaka. The citizens are leaving their houses in the area and some Syrian regime’s soldiers surrounded to the YPG forces. The UN says 69,000 people left their houses in Hasaka after Daesh attack. Rudaw TV denies the news about Daesh reaching the Kurdish area of Aziziya. Syrian regime asked every man and women in Hasaka capable of holding a gun to move immediately to the front lines and fight Daesh. Local sources in Hasaka say a group of National Defense Forces defected and joined Daesh which allow the latter to take over more areas in south Hasaka. The sources say the Kurdish forces are positioning in their areas and not participating in the fights. Twenty Syrian regime soldiers were killed in a Daesh car bomb attack on a security agency office in south Hasaka. A local source says Daesh took over the security agency office, the central prison, the national hospital and other governmental building in south Hasaka. Daesh says it gained a lot of weapons and ammunition including Kornet rockets from the Syrian regime forces and took over the Patrol Barrier between the Syrian forces and Deir Al-Zor. Daesh publishes photos of their advances in Hasaka. And a video. Daesh “rehabilitation” training for teachers in Raqqa. Daesh says it took over 4 Syrian regime’s security barriers between Salmiya and Raqqa. DaeshDaily Comment: Our sources in Anbar told us earlier that Daesh used to have a centralized kitchen and food distribution in Anbar even before they took over some cities there in 2014. Daesh establishes a popular market in Jazeera. Health sources say 13 were killed in a suicide attack on a Shia mosque in Kuwait. Daesh claimed responsibility for the attack. Kuwaiti Ministry of Health says 27 people were killed in the attack and 227 injured. Unconfirmed news about arresting the cell that planned the attack. A Tunisian security official says one of the terrorist who committed the attack on 2 hotels in Sousse that killed 27 people including western tourists was a student with no criminal records. Daesh supporters publish a video claiming it’s for the early seconds of the attack. Lebanese Army says it killed 2 armed men trying to sneak to Irsal town on the borders with Syria. Al-Shabab terrorist group says it launched an attack on the African Forces base in Ligo town in south Somalia killing 60 of them from Burundi. Al-Shabab says they started the attack with a car bomb then took over the base after an hour of heavy clashes. A photo of one of Daesh dead terrorists with a not-so-Islamic tattoo. An interview with Al-Qaeda leader in Mukalla in Yemen saying they took over the city. Daesh publishes a report about the current and former Qaeda leader who joined Daesh. Daesh publishes its religious guide and fatwas. A report about 4,500 displaced Anbar families in Habbaniya. The families say the government only provides them with dry food items and they are in dire need of more food and also medical supplies. The Sahwa leader in Qarma says Iraqi forces launched a major campaign in the Ksaiba area in Qarma and found a weapons and explosives storehouse. He also denies the reports about disputes between the PMFs and the Military leadership in Qarma. Iraqi Joint Operations Command says Baghdad Operations Command killed 3 Daesh terrorists and a sniper in Qarma and destroyed 11 hideouts and two vehicles. The Spokesman of Baghdad Operations Command says the Iraqi forces, supported by Coalition airpower, stopped a Daesh attack on Thirthar, killing 31 terrorists. The IJOC says Anbar Operations Command destroyed 3 Daesh vehicles with machineguns in Ameriyat Al-Falluja. The IJOC says the Iraqi Air Force launched 11 airstrikes on Daesh in several Iraqi cities and one killed 35 Daesh terrorists in Albu Shejel near Falluja. The IJOC says Iraqi forces destroyed a Daesh vehicle and weapon storehouse in Al-Salam intersection near Ramadi. The IJOC says Iraqi Army Aviation launched 6 airstrikes on Daesh in Anbar killing 11 terrorists and destroying 7 vehicles. A source in Anbar Operations Command says dozens of Daesh terrorists were killed in military operations in Haditha and Baghdadi west of Ramadi. Kata’eb Hezbollah say they surrounded Ramadi from the east, west and south and captured hundreds of Daesh foreign terrorists. DaeshDaily Comment: This report, which seems exaggerated, was not published on the KH website. A member of Anbar GC refutes the news about Iraqi forces launching a major campaign to liberate Ramadi and says the situation has not changed. He says Iraqi forces are waiting for orders to launch the operation and meanwhile get attacked by Daesh continuously. Another member of the GC says he will meet with the security and military commanders to discuss the reasons for the delay. He says Iraqi forces need only one victory in Anbar and Daesh will fall like “domino pieces” after that. He says the numbers of Daesh terrorists are decreasing and their leaders are fleeing to Turkey. The local PMFs Commander in Qarma says Daesh threatens to behead anyone in Anbar who watches TV series about radical groups. Many Arab TV stations are broadcasting such shows during Ramadan. Anbar GC says the prices of food and fuel items increased in a “scary way” in the cities and towns under Iraqi military control because of the continuous fights with Daesh and because there are no safe routes to transport goods. He says the situation in the cities under Daesh control is also catastrophic. The Iraqi Air Force dropped pamphlets in Falluja asking citizens to report Daesh terrorists and promising to kick them out. The Deputy Chairman of Anbar Governorate Council says there is a consensus in Anbar to approve the participation of Jordanian forces with the Coalition in fighting Daesh. Later on, the Deputy said his statement was misunderstood and the local government in Anbar cannot approve Jordanian participation without approval from the central government. The Spokesman of Anbar GC says the Council has never discussed this. Local sources say Daesh launched an attack on the Iraqi forces in Haditha. No further details were given. DaeshDaily Comment: Haditha is the last Anbar city on the Euphrates River still under Iraqi forces’ control. Capturing Haditha and its Dam would put Daesh in full control of the water resources to many southern governorates. Daesh pamphlet distribution in Ramadi. Iraqi Federal Police Commander says members of a terrorist cell responsible for many crimes against civilians were arrested in Baiji. They confessed to detonating houses, filming them, and then blaming Iraqi soldiers, under orders from the Daesh “minister of media”. Iraqi Joint Operations Command says Salahuddin Operations Command killed 4 Daesh terrorists trying to sneak into Baiji Refinery. The PMFs say Daesh terrorists are fleeing Baiji on boats to Shirqat. The PMFs also say 2 Daesh snipers were killed while hiding in a mosque. Iraqi JOC says the 11th Brigade of the Iraqi Army destroyed an IED factory near the Strategic Line. The IJOC says Dijla Operations Command arrested a Daesh terrorist and defused an IED in Mashariya in Salahuddin. The IJOC says Iraqi Federal Police killed 4 Daesh female snipers and 5 other terrorists in Albu Jwari. It also says they destroyed a Daesh vehicle in Samarra. A source in the IFP says they killed 3 female snipers (Afghani, Chinese and Indian) near Baiji. Daesh publishes photos of its snipers targeting Iraqi soldiers. A Sunni bloc in the Iraqi Parliament says Daesh executed one of its candidates in the previous parliamentary elections. The Chairman of Defense and Security Committee in the Iraqi Parliament says the crash of an Iraqi F16 jet during training in the US is “suspicious”. He also says the jet was not Iraqi “yet” since it was not officially delivered to Iraq and held the US government responsible for compensating the family of the pilot. Iraqi MoD says the jet went down while on a “training mission” from an airbase in Arizona. The MoD says the Coalition launched 2 airstrikes on Daesh, in Baghdadi in Anbar and Sinjar in Ninewa. A Sunni MP says he was kidnapped by Daesh supporters while trying to leave Jeddah airport in Saudi Arabia but the Saudi security forces raided the villa where he was held and freed him. The Iraqi Parliament opened an investigation of the MP traveling to Saudi Arabia without approval from Parliament. Iraqi Federal Police Command says its Intelligence Service arrested the media officer of Daesh’s “wilayat al-janoub” (the south governorate) in Adhamiya in northeast Baghdad. A security source says a civilian was killed and 5 injured when an IED exploded in an industrial area in Basmaya in south Baghdad. Another security source says an IED exploded in Mada’in in south Baghdad killing one civilian and injuring 3. A security source says one civilian was killed and 7 injured when a car bomb exploded in Shaab in northeast Baghdad. Daesh says it attacked Civil Defense units in Shaab with a car bomb parked on the roadside. A security source says a sticker IED exploded in a bus in Nadha in downtown Baghdad, injuring 6 civilians. A security source says an IED exploded in Bayya in south Baghdad killing one civilian and injuring 7. A security source says a roadside IED exploded in Mahmudiya in south Baghdad, killing a child and injuring 2 civilians. The IJOC says the Coalition launched 8 airstrikes on several Iraqi cities (2 in Baiji, 1 in Ramadi, 4 in Mosul and 1 in Baghdadi), killing 5 terrorists and destroying 2 vehicles and 24 hiding places. A security source says armed militiamen shot and killed a civilian driving his car in Baladiyat in east Baghdad. Another source says the militias kidnapped a man and his son in the Camp Sara area in downtown Baghdad. Former PM Maliki says he has sent his answers to the Mosul Fall Investigative Committee. DaeshDaily Comment: The Committee had said it was waiting for answers from Maliki and from the KRG’s President Masoud Barzani before it issues the final report. The KRG announced Barzani will not answer the questions sent by the Committee. The main Sunni bloc in the Iraqi Parliament says only 15% of PMFs are Sunnis, while the allocations in the budget for Sunnis equal 40%. Anbar is the one Sunni governorate with a high percentage; it recruited 7,500 fighters out of the 10,000 requested from the governorate. Ninewa was asked for 13,000 fighters and the local government submitted 7,000 names, but MPs from Ninewa say only 2,000 have actually volunteered and the rest are “Ghost Soldiers.” Many of the trainees were to be former police. This discrepancy caused the Iraqi government to stop paying salaries for all MoI employees in Ninewa. Iraqi Minister of Higher Education says a donation campaign to support the PMFs will start in Iraqi universities and other educational institutions in the coming days. A video of an Iraqi reporter being shot while covering a battle against Daesh. A security source says a policeman was killed and 3 injured when an IED exploded on their patrol in Mansouriya east of Baquba. A security source says 3 civilians were injured when an IED exploded near a commercial area in east Kirkuk. A source in the Turkmen PMFs says the Iraqi Air Force launched airstrikes on Daesh in the Basheer area south of Kirkuk, killing and injuring many of them and destroying vehicles. A local source in Ninewa says Daesh executed 4 civilians publicly in downtown Tal Afar, accusing them of “spying”. Eyewitnesses say Daesh shot and killed a doctor in Mosul accused of “not cooperating”. The eyewitnesses also say an armed group opened fire on Daesh fighters in Ta’meem in north Mosul killing 14 of them. The leader of Yazidi fighters in the Sinjar Mountain area says his troops have resorted to a defensive posture because they lack weapons and ammunition. He asks the central government to provide them with weapons. An officer in the Peshmerga says the Coalition launched an airstrike on Daesh in Najma village in Hatra, killing 7 terrorists. He also says the Coalition launched another airstrike on Daesh Al-Khazer, 45 km east of Mosul, destroying 5 vehicles and killing many terrorists. A Peshmerga commander says the Coalition bombed 3 Daesh locations in Al-Khazer and destroyed them completely. Daesh says it distributes money to poor people in south Mosul. And manufactures Katyusha rocket launchers. Daesh builds a water fountain in Tal Afar. 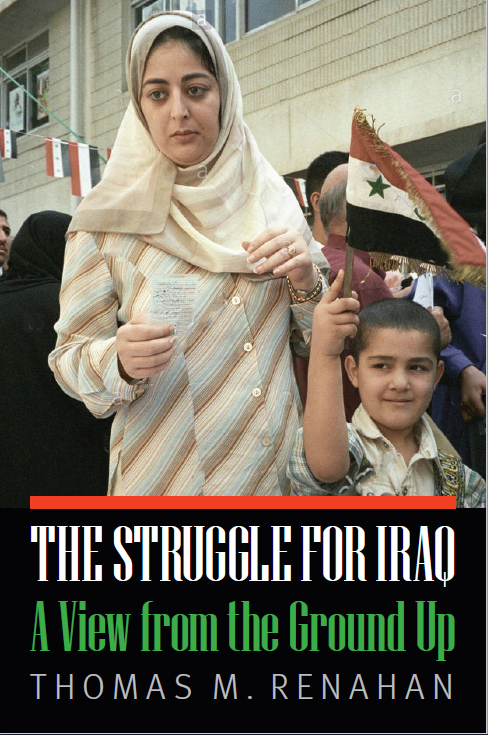 The 8th installment of the memoir by one of Saddam’s journalists about joining Daesh. The “journalist” was in Baathist groups in Iraq after 2003, then got asylum in Finland, then joined Daesh. A Turkish official says a Daesh car bomb that attacked Kobane didn’t come from Turkey. Official Syrian TV had said the car had entered Kobane through the Turkish border. A YPG spokesman says 35 Daesh terrorists entered Kobane from the southwest in 5 cars, holding Free Syrian Army flags and wearing its uniforms. When they reached the border they detonated one of the cars and opened fire randomly. He says 3 of them went back across the Turkish border. Medical sources say 15 people were killed and 75 injured in the attack. The YPG says 30 Daesh terrorists were killed in the attack. Eyewitnesses say some Daesh terrorists were dressed as YPG fighters. Daesh says its terrorists took control of the Pinar crossing border between Syria and Turkey and says the clashes continue in Kobane. A video of the car bomb explosion in Kobane. Rudaw TV publishes a video of Kobane and analysis of the attack. President Barzani issued a statement about the attack, asking the Coalition to help the people of Kobane. Daesh attacks the central prison in Hasaka with a car bomb and clashes erupt with Syrian government forces there. Local activists say people started leaving their houses after Daesh entered areas in Hasaka. Daesh says its fighters entered western Hasaka and killed 70 Syrian government soldiers. Daesh sells 42 Yazidi women in Al-Mayadeen city in Syria. There is no news about the children who were with them. Daesh beheads 12 members of the rival Jaish Al-Islam militia near Damascus (Video). Daesh says its terrorists regained control of Al-Afai Mountain in East Qalmoun from Jaish Al-Islam. Daesh takes over Zamzam near Sirte in Libya without resistance. The town is inhabited by the Gaddafi tribe and supporters. Daesh publishes photos of Sinai hospital in Sirte. A Daesh collection of its reports. DaeshDaily Comment: While we focus on Arabic media sources, other sources sometimes shed light on Daesh in Iraq. Many believe that Daesh captured Mosul and other cities with a major military attack. Most of our sources from Mosul, Tikrit, etc. say that Daesh had gained a measure of control in those places well before June 2014, using its network of supporters, armed groups, and corrupt Iraqi military and government officials. Daesh’s presence in Iraq is sustained by three elements: ideology, regional need/support, and local need/support. It’s a basic multiplication equation by which Daesh could wither if any of these elements becomes zero. Daesh cannot live without its international ideology that provides it with thousands of fighters and suicide bombers from many parts of the world. Daesh also cannot survive without regional support, from nearby countries buying its oil and keeping open borders that let those foreign jihadis in. However, the local element is most crucial, especially the Iraqi politicians, Baathists, and other anti-government citizens, from all sects and sides, who see Daesh as an ally. Without understanding these three elements, we cannot fight Daesh effectively. A member of Anbar GC says the delay in Anbar liberation battles is because of unspecified differences between the Iraqi government and the Americans. A member of Anbar GC says more than 6,000 tribal fighters were trained and armed with light and mid-size weapons by the Iraqi government and more fighters will finish their training in the coming days. Anbar Governorate Council says Anbar is suffering from a shortage of water because of a “water war” played by Turkey and Syria. A video of the PMFs destroying an attacking car bomb in Ramadi. A video of the Iraqi Golden Division’s clashes with Daesh in Anbar. Iraqi officers say Daesh is still shelling Ameriyat Al-Falluja in order to capture it. They also say only 450 meters separate them from Daesh. The Iraqi Ministry of Interior’s Al-Suqour Intelligence Cell published a video of an airstrike on Daesh leaders in Akashat in west Anbar. The spokesman of the MoI says 47 Daesh terrorists were killed in the airstrikes. Iraqi Join Operations Command says Baghdad Operations Command supported by Federal Police, tribal fighters and PMFs killed 8 Daesh terrorists and destroyed 3 vehicles in Qarma. Daesh publishes photos of the results of the bombing on Ramadi. Iraqi Join Operations Command says Iraqi Air Force launched 18 airstrikes on Daesh in several Iraqi cities including Juiba near Hit killing 27 terrorists including a Saudi and a Palestinian. Daesh publishes photos of shelling Iraqi forces in Anbar. A Sahwa Leader in Falluja says 30 Daesh terrorists were killed in the recent internal dispute (over stolen cars) including a former general in Saddam’s army. Daesh publishes photos of “education” seminars for young children in Falluja. An Iraqi police officer says Iraqi forces took over Baiji completely after 3 days of heavy fighting. He also says Daesh terrorists left to areas north of the Baiji refinery and the Iraqi forces are fighting them there. A security source says the PMFs killed a Daesh sniper hiding in a mosque on the east side of Baiji. Iraqi Federal Police Commander says Iraqi forces dismantled booby traps in 3 houses and destroyed 2 Daesh vehicles in Baiji. The Commander also says Iraqi security forces killed a suicide bomber who was about to detonate himself in a popular market in Baiji center. He also says Iraqi forces killed 8 terrorists in the Albu Jwari neighborhood in Baiji. Iraqi Joint Operations Command says Samarra Operations Command confiscated 13 Daesh boats in Dhiluiya. A security source says Iraqi forces launched a major operation to liberate the remaining areas under Daesh control in Baiji Refinery and move from there to liberate Siniyya town. Daesh publishes photos of the fights in Baiji. Iraqi Join Operations Command says Dijla Operations Command found an IED factory in Salahuddin and destroyed it. Asa’eb Ahl Al-Haq say they depend in the fights in Baiji on Iraqi militiamen who fought Daesh in Syria. A security source says 5 Iraqi Federal Police officers were killed and 8 injured stopping a Daesh attack on the Iraqi forces in Fatha, east of Tikrit. The source says Daesh attacked with 3 car bombs, then shelled the Iraqi forces with mortars, but the Iraqi forces stopped the attack after police and PMF reinforcements arrived from nearby Al-Alam. Salahuddin Governor says 1,700 displaced families returned to their houses in Tikrit and more are coming. He also says Tikrit Directorate of Health will resume work in its original location in the city; it was moved to Balad during the Daesh occupation. He also says the Directorate of Electricity restored power in the city in 11 days but thieves are stealing the electricity transformers. The Tikrit Mayor says 2,000 families returned after security checks and 15 suspects were arrested in the process. An official in the PMFs says Daesh used a new technique in a car bomb attack in Salahuddin, releasing one of their prisoners and give him a car bomb vehicle without his knowledge and have him drive it towards the target, where they detonate it. A source in Samarra Operations Command says the Iraqi Air Force launched an airstrike on Daesh near the Strategic Line west of Samarra, killing 10 terrorists and destroying a construction shovel and 2 car bombs. A video of an IED explosion in Tuz Khurmatu that killed a Lt. Colonel in the Peshmerga. An MP from the major Sunni bloc in the Iraqi Parliament says Iraqi officials, especially from Anbar, who are responsible for displaced people, are not trustworthy and misuse the funds allocated for the displaced persons. A police source says 2 civilians were killed and 6 injured in a car bomb explosion on Palestine Street in east Baghdad. Daesh claimed responsibility for the attack. A police source says an IED was detonated against an Iraqi army patrol in Mishahda in north Baghdad, killing one soldier and injuring 4. A security source says 2 civilians were killed and 6 injured in an IED explosion near a popular market in Al-Shaab in north Baghdad. A security source says a PMFs fighter was killed and 3 injured when an IED exploded on their patrol in Latifiya, on the road between Babel and Baghdad. DaeshDaily Comment: The recent attacks in the areas between Babel and Baghdad indicate a return of Daesh there. Iraqi forces supposedly liberated these areas but apparently Daesh can still infiltrate them. A security source says unknown armed men shot and severely wounded an officer in the Iraqi Intelligence Service, in Karrada. A leader in Kata’eb Hezbollah says the leaders of the “Islamic Resistance Factions”, i.e. the Shia militias, should be involved in the decision making in Iraq. DaeshDaily Comment: The Shia militias are already in charge of many of the streets in Baghdad and other cities, but some want more political influence. Iraq needs the militias but letting them into the government decision-making process would be a huge blow to Iraqi unity. Iraqi Joint Operations Command says the Coalition launched 9 airstrikes on Baiji, Zuwiya, Sinjar and Tal Afar killing 30 terrorists and destroying hideouts and vehicles. Baghdad Operations Command says Iraqi forces found a car bomb factory and 180 IEDs in Nibai area north of Baghdad. A spokesman of the PMFs says there is no (direct) coordination between the PMFs and the American advisers or the Coalition. He says the PMFs become part of the Iraqi forces and report to the Prime Minster and the Joint Operations Command. He also says the JOC coordinate with the Coalition. Vice President Osama Al-Nujaifi refutes WikiLeaks documents about his receiving money from the Saudi government. DaeshDaily Comment: Many Iraqi officials were implicated in these documents including Shia officials. A source in Diyala Police says 16 people were killed and 36 injured in a car bomb attack on a tribal leader’s house in Al-Nida village in Balad Ruz, 70 km east of Baquba. The tribal leader was kidnapped earlier today and his tribe met to discuss the kidnapping. Daesh claimed responsibility and said a Tajik terrorist led the attack. A local source in Kirkuk says Daesh formed a committee to destroy the shrines and the graves in Hawija during the month of Ramadan. A local source in Mosul publishes the names of the men Daesh executed yesterday and says they were working in groups fighting Daesh in the city. Daesh published photos yesterday of executing many people by drowning, electricity and an RPG rocket. A member of the Mosul Sheikhs Council says Daesh arrested 16 men for playing the Ring Game, a traditional Iraqi game played during Ramadan. Farmers in Ninewa say Daesh monopolizes the grain market and prevented farmers from selling their harvest through traders with lower prices. The Iraqi government usually buys the grain harvest at subsidized prices and distributes it through the food ration system. A local source in Mosul says Daesh forced people from Mosul who own more than one house to give one of their houses to foreign terrorists who arrived during the last 24 hours from Syria. The source says about 200 houses were taken. A security source says Daesh executed 55 civilians in Mosul, including 4 lawyers in Shalalat (= Waterfalls) north of Mosul, and buried them in a mass grave. A local source says Daesh detonated a 1,200 years old Sufi shrine in north Ninewa after arresting its two guards. A Kurdish official says the Coalition launched an airstrike on Daesh on the western side of Sinjar, killing 21 terrorists and destroying 6 vehicles. A Kurdish official says Daesh opened a new prison for women in Mosul. Local sources in Mosul say Daesh asked the teachers in the city to register for the new education year and ask them to pledge allegiance before they can start their work. A Yazidi MP says 3,000 Yazidis are migrating from Iraq every month through Turkey. A Kurdish MP says the Iraqi government intends to close down Mosul Liberation training camps in Kurdistan. DaeshDaily Comment: The camps were established 8 months ago for police officers from Mosul who left the city after the Daesh invasion. Ninewa Operations Commander says the recent Coalition airstrikes on Daesh destroyed their capabilities in east and west Mosul. He says the Coalition bombed a tunnel used to transport weapons in Wa’eliya, a tank bomb in Qabak, and an IED factory in Qayyara. He also says 40 Daesh terrorists, including foreign explosives expert were killed in an airstrike on Tal Abta water project in Qayyara. A Kurdish official says the Peshmerga killed 5 suicide bombers trying to attack the Kurdish forces in Nouran area east of Mosul. Ninewa Governorate Council says Atheel Al-Nujaifi is still the governor of Ninewa and they haven’t submitted any nominees, while waiting for the Federal Court to rule in his appeal. A security source says a Daesh terrorist was arrested in Kerbala. The source says the security forces confiscated the suspect’s laptop and found information about 7 car bombs intended to be detonated later. A report about the bad conditions faced by displaced families now in Maysan. A Kurdish news website says Kurdish families from Raqqa were driven from their houses in Tadmur, but some of them managed to reach Kobane. Kurdish sources say Daesh is forcing the Kurds to move from Raqqa to the desert in Tadmur, comparing it to Saddam’s infamous Anfal campaign. They also say Daesh allowed Kurds who pledged allegiance to them to stay in Raqqa. Syrian News Agency says a car bomb exploded near a mosque near Damascus, killing 13 civilians. Daesh claims responsibility for the two suicide attacks in Hasaka yesterday and says one of the suicide bombers was Iranian. Rudaw TV says 10 children were killed in the first attack, near the Kurdish Security headquarters and a children’s hospital, and dozens of Syrian government soldiers were killed in the second attack. Arab tribes in Al-Jazeera in Syria announce the formation of Al-Jazeera Shield Brigade to “fight terrorism” and to prevent demographic changes in the area by the Kurds. Daesh prayers in Deir Al-Zor. Daesh grain factory in Jazeera. Daesh IEDs factory in Damascus. And preparing food for their terrorists. Daesh pamphlet distribution in Raqqa. A video of Daesh supporters driving through Jordan’s capital Amman. The Minister of Religious Affairs in Algeria says only 63 Algerians are fighting with Daesh in Iraq and Syria. Daesh religious lessons in Sinai. For some reason, our DaeshDaily twitter account has been suspended! The MoD says Jazeera Operations Command and Iraqi Army 7th Infantry Division supported by tribal fighters and PMFs liberated many areas in Baghdadi and broke the siege on the residential compound in the town. A member of Baghdadi Subdistrict Council contradicts the report and says dozens of Baghdadi families left for Daesh-controlled Hit because of the lack of basic human services. Daesh publishes a video of an IED explosion targeting the Iraqi forces in Baghdadi. The Spokesman of the PMFs refutes the reports about Daesh launching a major attack on Iraqi forces in Nukhaib. Kerbala Police Commander also refutes the reports and says they are part of the Daesh psychological warfare. DaeshDaily Comment: Daesh said yesterday a Tajik terrorist attacked Iraqi forces in Nukhaib with a car bomb. A local source in Anbar says a group of tribal fighters sneaked into the city of Hit and blew up a Daesh car bomb factory. A leader of the Sahwa in Anbar says 20 Daesh terrorists were killed in internal disputes in Hit. Another Sahwa leader says 12 Daesh terrorists were killed in similar disputes in Falluja. A security source says the Iraqi Air Force bombed Daesh in Rutba in west Anbar, killing 4 terrorists. Iraqi Ministry for Human Rights says Iraqi forces found a mass grave of 40 people who had been kidnapped by Daesh in Al-Qanater near Qarma. A video of the Iraqi forces fighting Daesh in Qarma. The leader of Sahwa fighters in Qarma says Iraqi security forces supported by tribal fighters and PMFs liberated 3 areas in Qarma, killing dozens of Daesh terrorists. He also says 3 car bombs were found and defused in Qarma. Iraqi Joint Operations Command says Baghdad Operations Command forces killed 17 Daesh terrorists in Qarma and destroyed many of their vehicles. The JOC says Anbar Operations Command killed 24 Daesh terrorists and destroyed 4 anti-aircraft machine guns and rocket launchers in military operations in several areas east of Ramadi. The JOC says the Iraqi Air Force launched 17 airstrikes on Daesh chemical storehouses in Hsaiba east of Ramadi. The IAF also targeted a meeting of 30 Daesh terrorists in the same area, killing many, including a Daesh leader in Hsaiba. The JOC also says the Coalition launched 10 airstrikes on Daesh in several Iraqi cities. DaeshDaily Comment: The JOC has started to broadcast daily reports about its operations, based on PM Abadi’s instructions to unify the media messaging and reporting. A security source says 5 Daesh terrorists were killed in a failed attack on the Iraqi forces in Saqlawiya north of Falluja. A source in Falluja hospital says 7 people were killed and 8 injured, including women and children, in the Iraqi forces’ shelling on different areas in Falluja. Anbar Governorate Council issued a statement asking the Iraqi government to stop shelling Falluja, saying many civilians are trapped in the city because Daesh doesn’t allow them to leave. A Sunni MP says the Iraqi Joint Forces Command should take a “brave” decision and take over Falluja instead of shelling the civilians there. A Sahwa leader in Falluja says Daesh is taking money from the families as payment for letting them leave the city. Daesh publishes photos of the results of the bombing on the Sajar area in Falluja. Daesh Twitter accounts say Daesh leader Baghdadi gave amnesty to Sahwa and security officers in Anbar after requests from tribal leaders. Iraqi Federal Police Command says several Daesh terrorists were killed and 2 vehicles destroyed in a security operation in Baiji. The IFPC also says 3 booby-trapped houses were restored to normal and mortars were confiscated in Baiji. Iraqi Federal Police Commander says Iraqi forces targeted a Daesh food and medical supply convoy of 3 trucks in Fatha east of Tikrit with Kornet missiles and destroyed them. The Mayor of Baiji says 2,000 displaced families returned to their houses in south Baiji regardless of the lack of support from the directorates of health and trade. He also says young men from these areas started voluntary cleanup campaigns. A PMFs source says his troops in Baiji killed a Daesh leader called Abu Khalifa Al-Yamani, responsible for Daesh intelligence. The man executed by Daesh in Salahuddin two days ago was a Ph. D. holder and Sunni cleric. A security source the man was executed because his tribe (Qaisi) joined the fight against Daesh. A security source says a civilian was killed when an armed group shot him in Tuz Khurmatu, 120 km east of Tikrit. A video of the Iraqi forces capturing a man trying to smuggle weapons to Daesh in his truck. UNAMI says more than 3 million Iraqi people have been displaced since January 2014. More than 2.2 million are from Anbar and Ninewa and almost half a million from Salahuddin. The Speaker of the Iraqi Parliament asks the central and the local governments to help the displaced people to return to their houses in Babel and Diyala. DaeshDaily Comment: Beyond immediate military requirements, how to deal with citizens displaced by the fighting is one of the government’s major internal problems. Whether Iraq succeeds as a country may depend on these decisions. Most of these displaced people are Sunni Iraqis, many already dissatisfied with the government and political system. They don’t trust the government and the government and its supporting Shia militias don’t trust them, but the government and militias usually don’t know which ones are anti-government. Even before Daesh, long-term displaced people have often been receptive to joining radical armed groups, on all sides, for obvious revenge reasons. The Iraqi government should look beyond providing displaced people with humanitarian help, which it is not doing well, and also focus on expediting people’s return to their homes and schools after Daesh has been cleared from the area, to avoid alienating those citizens. This involves the unavoidable risk of helping some of the wrong people but would be one way for the Iraqi government to start the real peace-building process. Local sources say Iraqi police found 2 bodies shot and killed in west and southwest Baghdad. Hours before that, 4 bodies were found in other areas, one of them a woman. PM Abadi says the phenomenon of the unknown dead bodies in Baghdad has become worrisome and should be dealt with. He did not say by whom. A security source says an IED exploded near a Sahwa leader’s house in Abu Ghraib in west Baghdad, killing his brother and 4 other civilians. Eyewitnesses say armed men in 3 cars without registration plates kidnapped an employee in the Iraqi Ministry of Trade and an officer in Saddam’s army from their houses in Zayouna in east Baghdad. A security source says a sticker IED exploded in a civilian car in Ghazaliya, killing the driver. An MoI source says the body of man kidnapped from Baquba was found in Shula area in northeast Baghdad, shot in the head and chest. An MoI source says an IED exploded in Nahrawan area in south Baghdad killing one civilian and injuring 4. A police source says Iraqi security disassembled an IED planted in the house of an employee in the Ministry of Electricity in east Baghdad. Kata’eb Hezbollah offers financial rewards to anyone who brings in foreign Daesh terrorists alive. The Kata’eb offered $12,000 for western terrorists, $10,000 for those from the Gulf, Lebanon and Algeria, $7,000 for Caucasus, Turkey and Uighur fighters (western China). The organization offered no money for turning in Iraqis, Syrians, Pakistanis, and Afghans, (an implied invitation to just kill them). Iraqi Minister of Defense visits Serbia and meets with Serbian officials to discuss military cooperation. A security source says 3 Daesh terrorists were killed in an explosion while trying to transport explosives between Diyala and Salahuddin, in Mtaibija village north of Baquba. Local sources say an IED exploded in Qara Tappa, north of Baquba, killing 2 and injuring 6. A local source says a (Shia) militia kidnapped a tribal leader from his house in east Baquba. A security source says an IED targeted a police patrol in Muqdadiya, killing a police officer and injuring 2. Kurdish security forces broadcast the confessions of 4 terrorists who planned a suicide attack on a hotel in downtown Kirkuk in January. A security source says Daesh executed a Turkmen civilian in front of his house in south Kirkuk. A source in the PMF says Daesh also detonated Turkmen houses in Basheer, 25 km south of Kirkuk. Daesh publishes photos of its terrorists in Kirkuk. Daesh is using new ways to execute people in Mosul, by drowning them in a cage in water, electrifying them, or putting them in cars to be attacked with with RPG rockets. Daesh publishes a video of these executions. DaeshDaily Comment: The people executed were arrested recently and accused of spying. A security source says an IED explosion targeted a Daesh convoy near the Mosul southern gate, killing 4 Daesh “ministers” in Mosul (finance, health, water and municipalities). Iraqi Ministry for Human Rights says Daesh is training 1227 boys age 9-15 in Al-Salamiya training camp east of Mosul. Kata’eb Al-Mosul Facebook page about the resistance operations against Daesh in Mosul. A source in the Peshmerga says the Coalition launched airstrikes on Daesh in Bertilla, 40 km east of Mosul, killing 17 of them. The source also says the Peshmerga stopped a Daesh attack on Yazidi villages in Sinjar, killing dozens of terrorists. Deputy Chairman of Ninewa Governorate Council says the Iraqi government stopped paying the salaries of the 8,000 volunteers five months ago. The volunteers are policemen from Mosul, training in Kurdistan and Ninewa valley for Mosul liberation battles. Daesh publishes photos of its Hisba (control) operations in Mosul. A police commander from Ninewa says the Coalition bombed a Daesh car as it crossed the 4th Bridge in Mosul, killing 3 Daesh Arab leaders. The Security Committee in Ninewa GC says preparations to start liberating areas in south Mosul have been completed and the operations will start in the coming days. A local source in Mosul says Daesh distributed its new golden coin on a limited scale in some areas in Mosul, and supporters published the photos on social media. The source also says Daesh will start using the coin by the end of the month of Ramadan. Daesh destroys another celebration platform in Mosul. Local sources say the citizens of Mosul used the platform to make phone calls because the network coverage was better there. Daesh also lashed 3 young men, accusing them of cursing the caliph. Al-Yamani Group, a small violent Shia cult, reappeared in Basra asking people to join its new militia, Saraya Al-Qaem to fight Daesh. The group was fought by the Iraqi military in 2008, then disappeared. A source in Al-Burkan Operations Command (a coalition of Syrian armed groups and the YPG) says the YPG will not move towards Raqqa after liberating the Brigade 93 area and Ain Eisa, 55 km west of Raqqa. The source says Daesh still controls south of Kobani and the town of Sareen, and the YPG’s priority now is to liberate these areas. Rudaw TV says two car bombs exploded in Hasaka without causing any casualties. A source in the Turkish Foreign Affairs Ministry says his government refuses to meet with a Syrian Kurdish leader and demands his troops stop displacing Arab residents in Tal Abyad. DaeshDaily comment: This is a variation of the displacement problem commented on above regarding Iraq. There is a claimed security motive in not trusting some residents, but the effect of displacing Arabs is to make the population more Kurdish, which makes the tactic suspicious. Similar accusations have been made against the Iraqi Kurds in northern Iraq. One concern in Syria is that such tactics could actually make Daesh stronger. The General Command of the Kurdish security forces in Syria (Asayesh) says they received 80 remote-control drones to be used in special security operations. They didn’t mention the source of the drones. The Director of Syrian Museums and Antiquities says Daesh destroyed two shrines in Tadmur, one of them on UNESCO’s World Heritage List. Daesh publishes photos of the results of the airstrikes on Zabadani. And Sareen. A Daesh dairy in Hama. And shelling in the same city. Daesh Zakat collection in Aleppo. And street light maintenance. A Kurdish source says Daesh gave an ultimatum to the Kurdish citizens in Raqqa to leave the city in 3 days for Homs and Tadmur, as a security precaution against sleeper cells. DaeshDaily Comment: Daesh has always expressed animosity towards Kurdish troops and political parties but it is unlikely to start a propaganda war against Kurdish Muslims, as some Daesh leaders in Iraq and Syria are Kurds. Daesh issues a new audio speech by its spokesman Abu Mohammed Al-Adnani. Adnani says Ramadan is the month of jihad and not forgiveness. He asked the displaced people from Anbar to return to their houses and promised an amnesty to Sahwa and security officers. Adnani also threatened armed groups in Libya and Afghanistan if they continue their opposition to Daesh. Daesh publishes a video of its attacks in West Africa. Al-Qaeda-linked cleric issues a statement against claims by Daesh that it is establishing a religious caliphate. Daesh supporters say all jihadi groups in the Caucasus united under Abu Mohammed Al-Qadari, who was appointed by Baghdadi as emir there. Moroccan Ministry of Interior says it arrested a radical Islamist who confessed he used to finance Daesh from his trade in expired food items. Moroccan Minster of Interior said earlier 1350 Moroccans are fighting with Daesh in Iraq and Syria, including 220 ex-prisoners. A Sahwa leader says his troops found 2 car bombs and disassembled 77 IED in different areas of Thirthar and Jazeera in north Anbar. A source in Falluja hospital says the hospital received 300 dead bodies and 190 injured terrorists during the month of June so far. Anbar Operations Commander says Iraqi artillery shelled Albu Shejel area in Saqlawiya southeast of Ramadi, killing 15 Daesh terrorists and injuring 20. A man from Falluja says Daesh beheaded his cousin publicly after accusing him of smoking. A security source says 11 Daesh terrorists were killed and many IEDs disassembled in the ongoing operations to liberate Qarma east of Falluja. Iraqi MoD says Baghdad Operations Command killed 6 Daesh terrorists and destroyed a vehicle, a motorcycle, and a tank bomb in Qarma. DaeshDaily comment: There are seemingly constant positive battle reports on Qarma, but these also serve to show implicitly that the government does not control it. Ameriyat Al-Falluja Police Commander says Daesh shelled the town with mortars during Ramadan food distribution, killing and injuring many civilians. Dijla Operations Command says Iraqi Federal Police killed 5 Daesh terrorists and destroyed their vehicle in Tal Masoud east of Ramadi. A source in the Iraqi 1st Rapid Intervention Division says an Iraqi Daesh leader was killed in a failed attack on the Division’s headquarters south of Falluja. 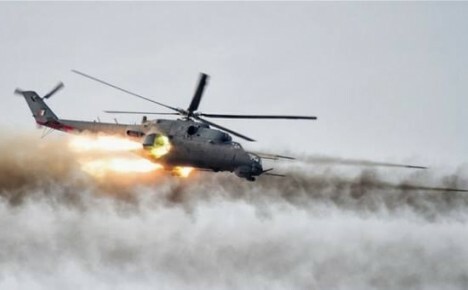 A source in Iraqi Army Aviation says the IAA bombed a Daesh meeting in a house in Khaldiya east of Ramadi, killing 20 terrorists and destroying 3 vehicles. Local sources in Anbar say Daesh issued warnings to the people of Ramadi and Falluja not to watch some TV programs and shows during the month of Ramadan and threatened them with severe punishments. Local sources say 2 Iraqi soldiers were killed and 8 injured when a car bomb targeted their checkpoint in Nukhaib, between Anbar and Kerbala. Daesh says a terrorist from Belgium attacked the Iraqi forces in Nukhaib. The MoD says the Coalition launched 18 airstrikes on Daesh in several Iraqi cities killing 7 Daesh terrorists and destroying weapons and equipment. Daesh publishes a video of torturing Sahwa members in Anbar. A video of an Iraqi Air Force airstrike on Daesh (location unspecified). A member of Diyala GC says a Daesh terrorist shot and killed his father and brother for refusing to join Daesh in Shirqat. Daesh opens a swimming pool in Shirqat. And road paving. Daesh publishes photos of executing 2 PMFs fighters in Salahuddin. A security source says Iraqi forces started to clear the houses and streets of IEDs in Baiji center as a first step to allowing displaced families to go back to their homes. The PMFs say they continued advancing inside Baiji from the east and the west killing dozens of Daesh terrorists. Iraqi Federal Police Commander says Police Commandos killed 3 Daesh snipers and defused 18 IEDs in Baiji. Daesh says a Syrian terrorist attacked the Iraqi forces in south Baiji with a car bomb, killing and injuring many of them. A member of the Salahuddin GC says the Council met with the tribal leader in Yethreb to arrange for the return of displaced families. The town was liberated from Daesh months ago but the displaced families were not allowed to return for several reasons. A source in Salahuddin Operations Command says Iraqi Army Aviation bombed several areas north of Tikrit, killing 30 Daesh terrorists. Dijla Operations Commander says Iraqi forces have so far destroyed 13 Daesh training camps in Himrin Hills, between Salahuddin, Diyala and Kirkuk. The Speaker of the Iraq Parliament met with Anbar’s Governor and says the government is ready to arm and train 10,000 tribal fighters from the governorate. The Speaker also met with a prominent tribal leader from Mosul to discuss the efforts to liberate it from Daesh. The MoD says Iraqi Military Intelligence Service arrested 3 Daesh members in Baghdad responsible for media activities. They confessed to receiving Daesh media materials and distributing them on social media. An MoI source says an IED exploded under a small bus in Mashtal east of Baghdad, killing one civilian and injuring 4. A website close to Daesh says the explosion was caused by a car bomb. A security source says 2 civilians were killed and 7 injured in an IED explosion near a popular market in Taji in north Baghdad. An MoI source says an IED exploded near a popular restaurant in Husseiniya in north Baghdad killing 2 civilians and injuring 6. A security source says an IED exploded in a marketplace in Abu Dsheer in south Baghdad, killing one civilian and injuring 8. A security source says an Iraqi soldier was killed and 6 injured when an IED exploded on their patrol in the Arab Jubour area in south Baghdad. The major Sunni Bloc in the Iraq Parliament asks PM Abadi to withdraw the current draft of the General Amnesty Law and rewrite it according to the previous political agreement. The Chairman of the Security and Defense Committee in the Iraq Parliament met with the Russian and the French ambassadors individually to discuss their countries’ support for Iraq in the war against Daesh. The Chairman of the Security and Defense Committee in the Iraqi Parliament says the Mosul Fall Investigative Committee got “dangerous and scary” confessions and other evidence about Mosul’s fall and many people will be indicted when the final report gets published. A member of the Iraq Human Rights Commission says Daesh recruited 500-800 Iraqi children to participate in its terrorist activities. Iraqi MoD page on Facebook. Diyala Police Commander says the 1st Emergency Regiment of the Police graduated. He says the Regiment has 600 troopers, trained to fight in the open deserts and in the cities. A security source says a PMFs fighter was injured when an IED exploded on the roadside north of Muqdadiya. A security source says Iraqi Army Aviation bombed Daesh locations in Hawija and killed 2 Daesh Yemeni leaders responsible for killing Iraqi civilians and destroying their houses. Local sources in Hawija say Daesh is asking the people of the city, through mosques and mobile loudspeakers, to donate money. Daesh is telling the women in Hawija not to leave their houses without a man or else they will be punished severely. The punishment will be beheading if they repeat the “offense” twice. The sources say Daesh also threatened anyone who doesn’t fast during Ramadan, though their fighters are not fasting. A local source says Daesh started a new campaign to destroy the Sufi shrines and graves in western Kirkuk. A security source in Ninewa says some Daesh terrorists are intentionally injuring themselves in order to be transported to Turkey and then run away to their countries from there. A security expert says the Peshmerga burned an Arab village near Rabia completely after confiscating the belongings of the villagers. He says the village has never been under Daesh control and the villagers are now displaced in the nearby valleys. A local source in Mosul says Daesh kidnapped 54 civilians, including women, accusing them of spying, a readymade accusation against anyone who opposes them. The source says Daesh cut off the limbs of some of these people. Iraqi Ministry for Human Rights says Daesh executed 25 people publically in Dawasa in downtown Mosul, accusing them of spying. The Commander of the Yazidi militias says the promised German aid and training for his troops has not started yet. Iraqi Ministry of Tourism and Antiquities says Daesh established a garden and an amusement park at the location of Nabi Younes Mosque in Mosul. An Iraqi officer says Daesh executed 3 former Iraqi Parliament candidates in Mosul. Daesh billboards in south Mosul. And burning more cigarettes. The Spokesman of the National Mobilization Forces in Ninewa says 4,500 fighters finished their military training and were equipped with 50 armored vehicles in preparation for Mosul liberation battles. He also says an NMF delegation met with the American Embassy in Baghdad and discussed arming and equipping the NMFs. DaeshDaily comment: This is a separate Ninewa Sunni volunteer organization, not part of the PMF organization. Basra GC says 400 PMF fighters and 250 Army and police from Basra were killed in the fights against Daesh so far. Barzani Charity says it will send food and fuel supplies to 5,000 Kurdish families in Tal Abyad. One of the founders of Raqqa is Being Slaughtered Silently says Daesh beheaded his father after kidnapping him 77 days ago. The YPG says it continued its advances southwest of Suluk town and retook a village from Daesh there. The YPG also says one of its Turkish fighters was killed in Jazeera in the fight against Daesh. A source in Burkan Operations Command says the Kurdish forces supported by the BOC took over large areas of the former Brigade 93 camp in Tal Eisa and killed 19 Daesh terrorists. The Brigade was taken from the Syrian regime forces previously and became a base for Daesh. Rudaw TV says Turkey started to dig a trench on its borders with Syria near Qamishli to discourage the influx of Syrian refugees. The Syrian regime says its troops advanced against Daesh in the Al-Bayarat area in Homs and are 10 km away from Tadmur. Daesh publishes photos of its mortar attacks on the Kurdish forces in Jazeera. Daesh publishes photos of the food market in Raqqa. Daesh publishes a video of battles in Aleppo countryside. Daesh is building a mall in Aleppo. The local markets in Manbaj. Daesh terrorists in the Euphrates River in Deir Al-Zor. And a tribal reconciliation gathering. Daesh starts the destruction in Tadmur. Daesh publishes photos of the damages after the airstrikes in Tadmur. Daesh publishes photos of lashing an alcohol dealer in Tadmur. Daesh publishes a video of the confession of one of the Southern Front fighters in Syria who says he was trained in Jordan. Daesh says a Tajik terrorist attacked the PKK forces in Tal Abyadh with a car bomb killing and injuring many of them. A Saudi actor receives death threats after acting in an anti-Daesh TV show. A security source in Egypt says 3 policemen and 5 civilians were injured in IED explosions in 2 houses used for police housing in Areesh in north Sinai. Widespread resentment is reported in Lebanon after a video appeared showing torture of Salafi Muslim prisoners in Rumia prison arrested for alleged ties to Daesh or Al-Qaeda. Many people accused Hezbollah of participating in the torture. Daesh issued a statement urging the Sunni people in Lebanon to revolt after the video was published. Daesh tells the mother of one of the Lebanese soldiers they captured months ago they are going to execute him. Daesh publishes photos of its new coins. Daesh claims responsibility for an IED attack on Houthis checkpoint in Sanaa in Yemen. Daesh says the Libyan government in Tripoli and its troops are “Kuffar” (infidels) and should be killed. Derna Mujahedeen Council issues a statement explaining why the fought Daesh. A book about Saddam’s life was found in one of Daesh’s cars in Derna. Daesh publishes a video of pledge of allegiance from several republics in Russia. News about 2 suicide bombings in a fish market Nigeria killing 21 people and injuring 50. Daesh audio newsletter in Arabic. Daesh publishes its statistics from the month of Shaaban (May-June). The Spokesman of Anbar GC says the displaced people from Anbar lack the basic humanitarian assistance and the Iraqi government is not doing a good job in this regard. He asks that international organizations provide water, food and medicine for them. A source in Anbar Operations Command says dozens of Daesh fighters were killed in a failed attack on the Iraqi forces near the construction site for the new Falluja University, located outside the city. Another source says 3 Iraqi soldiers were killed and 4 injured in the attack. An Anbar police source says Iraqi forces killed 12 Daesh terrorists, including a Jordanian leader called Saeed Al-Hajji, in a military operation in Albu Farraj, north of Ramadi. Another source says Iraqi security forces supported by PMFs and tribal fighters killed 3 terrorists in Albu Farraj including one from China. A police officer in Ameriyat Al-Falluja says Iraqi security forces arrested 25 suspects in Ameriyat and Al-Siyahiya in a preemptive operation. The MoD says 10 of the arrested suspects were in prison on terrorism charges but released by Daesh recently. A member of Anbar GC says the Iraqi government ordered the local government in Anbar to arm 3,500 tribal fighters from the governorate after they finished training with Iraqi and American advisers and add them officially to the PMFs. Baghdad Operations Command says Iraqi forces continued operations to liberate Qarma killing 10 terrorists, including 2 snipers, and destroying 8 hideouts and 3 car bombs. Another Iraqi unit destroyed a ferry and confiscated 2 vehicles and found a weapons storehouse in north Qarma. Anbar Operations Commander says Iraqi forces supported by Coalition air power attacked several areas west of Ramadi killing 17 Daesh terrorists, including a suicide bomber who attacked the Iraqi forces with a truck bomb. Iraqi forces also destroyed 3 vehicles outfitted with machine guns as well as a huge weapons storehouse. Iraqi MoD says Iraqi forces supported by the Iraqi Air Force killed 124 Daesh terrorists and destroyed 4 locations and 8 vehicles in Anbar, Kirkuk and Salahuddin. The MoD also says the IAF destroyed a Daesh sharia “court” and a big weapons and chemicals storehouse in Sajjariya in Ramadi. The MoD says Iraqi Army Aviation bombed Al-Malahma east of Ramadi, killing 15 Daesh terrorists and destroying 3 vehicles. The Ministry also says the IAA destroyed several ferries carrying Daesh vehicles between Malahma and Saqlawiya. Local sources say Daesh launched mortar attacks on the Iraqi forces in Al-Mazraa area east of Falluja, killing and injuring many Iraqi soldiers. Iraqi MoI says the Iraqi Air Force, based on information from Al-Suqour Intelligence cell, bombed a Daesh location in Hit and killed 19 terrorists including the Syrian Abu Ammar Al-Shami and injured 4 others. MoI says Shami was a close aide to Abu Sayyaf, the terrorist killed by an American airstrike in Syria recently. The MoD says Iraqi Army Aviation bombed four Daesh locations in Khaldiya, killing 9 terrorists. The Mayor of Baghdadi, in Hit District, asks the central government to help restore electricity and water services. He says he asked the Anbar local government but got no response. Baghdadi has been under siege by Daesh for a year now. Daesh publishes photos of their car bomb and IED factory in Falluja. Daesh publishes photos of the alleged Iraqi military jet falling in Anbar. A security source says Iraqi forces ambushed and killed 13 Daesh terrorists, including suicide bombers from Arab countries, as they were trying to sneak onto the Ajeel oil field. Iraqi Federal Police Command says its 5th Division conducted a special operation near the Strategic Line (Baiji to Anbar oil pipeline) that destroyed a Daesh convoy and killed dozens of terrorists. Vice President Osama Al-Nujaifi says the PMFs are supporting the Iraqi Army in the fight against Daesh but should be under the command of the official military establishment. He also says the allegations that the PMFs committed systematic crimes in Tikrit are not true and that the abuses committed were separate individual incidents. Likewise, Vice President Ayad Allawi says the PMFs should be within the military establishment; otherwise the result will be warlords in the country. Allawi also says the requirements for winning the war against Daesh are missing, because of (1) the lack of coordination with the Coalition and (2) the fact that national reconciliation is still out of reach. He also says Arab countries have offered use of their airports and support by their air forces to help Iraq in the fight against Daesh. The Commander of the Fayli (Shia) Kurds Brigade says it has 1,735 fighters and 5,000 registered volunteers. He asks the Iraqi government to provide them with the necessary weapons and supplies to fight Daesh. Baghdad Operations Command says Iraqi forces raided Al-Hora and Tarmiya in north Baghdad, killing 25 Daesh fighters and defusing 3 booby-trapped houses and 7 IEDS. The BOC also says it arrested a terrorist in Hor Al-Basha and confiscated 3 suicide belts and other explosives. A security source says 2 civilians were killed and 7 injured in an IED explosion near a popular market in Abu Ghraib in west Baghdad. Local sources say Iraqi security forces conducted raids in Zobaa tribe areas in Abu Ghraib and arrested many of them. A security source says a civilian was killed and 7 injured when 2 mortar shells fell on a residential area in Saba’ Al-Bor in north Baghdad. A website close to Daesh says an IED exploded under a small bus in Mashtal in east Baghdad, killing or injuring 6 people. Iraqi Union of Writers says a group of 50 armed men in black military uniforms raided the Union offices, destroying some of its furniture and confiscating the weapons of the MOI-appointed guards before they left. Asa’eb Ahl Al-Haq publishes a video about how Daesh booby-traps houses. Al-Mada Press publishes the draft of the Iraqi National Guards Law. MoI says Iraq reached an initial agreement to buy dual-use helicopters from Germany. A security source says an IED exploded near a house in Abu Saida subdistrict, killing 2 civilians and injuring 4. Daesh publishes photos of Al-Taraweeh prayers in Kirkuk. DaeshDaily Comment: As we reported yesterday, many Arabic news sources said that Daesh prohibited these prayers. A video of the Iraqi Air Force bombing Daesh locations in Hawija. A local source says Daesh executed 4 young men in Mosul, accusing them of breaking the Ramadan fast publicly. A Shabak MP says the Peshmerga are preventing displaced Arab families from returning to their houses in the Rabia area west of Mosul. A report about Syrian merchants controlling the markets in Mosul. A report about the catastrophic situation in Dhi Qar Governorate because of the water shortage. Daesh cut the Euphrates River water flow severely and many southern Iraqi governorates are suffering. The Spokesman of the Council of Salahuddin Tribes says a delegation from the Governorate met with officials in Kerbala to facilitate the entrance of displaced families from Salahuddin who got trapped in the Al-Nukhaib area between Anbar and Kerbala. As we reported yesterday, Kerbala closed the road after 8 car bombs were found with displaced families. A Turkish news agency says 1,000 refugees from Syria returned to their houses in Tal Abyad. Syrian Kurdish forces say they liberated 3 more villages south of Suluk in Tal Abyad District and killed 7 Daesh terrorists during the last 24 hours. Four Kurdish fighters were killed in the battle. Daesh says it stopped an attack by Kurdish forces near Kobani and killed 9 Kurdish fighters. Daesh publishes photos of the equipment they took from the Kurdish forces in the Kobani countryside. Daesh publishes photos of the results of the American airstrike on Raqqa. Daesh publishes photos of the fruit market in Tadmur. Daesh publishes photos of Taraweeh prayers in Homs. A report about Iraqi refugees in Turkey. Malaysian Foreign Affairs Minister says Islamic countries should hold a meeting to condemn Daesh crimes in Iraq and Syria. He also says Daesh actions are far from Islam and that Muslims should work to change the negative perceptions Daesh is spreading about Islam. Al-Shabab terrorist organization issues a statement about their attack on the Ethiopian forces in Somalia. Daesh publishes photos of their propaganda activities in Afghanistan. Daesh publishes photos of beheading another “spy” in Afghanistan. Daesh publishes a letter from one of its terrorists in a Hamas prison. A leaked Hamas document about Daesh expansion in Gazza. Daesh security instructions for its supporters in Gaza. Daesh issues a video about the celebrations of its Egyptian terrorists in the first anniversary. Daesh offers 10,000 USD to any of its terrorists who kills a member of the Iranian Revolutionary Guard. Daesh audio newsletter for today. The Chairman of Anti-Daesh Tribes Council in Anbar says the Iraqi Air Force launched an airstrike on a Daesh convoy coming from Syria, between Khasfa and Hit, destroying 12 vehicles loaded with heavy and mid-size weapons. Anbar GC says preparations are ongoing for the military operations to liberate Ramadi and Falluja. The Council says the final decision to start the operations is in the hands of PM Abadi. A member of Anbar GC says Iraqi forces are surrounding Daesh controlled areas from all sides in order to cut their supply lines. A video of Al-Shaheed Al-Sadr militia preparing to advance in Anbar. Anbar GC says 3,500 tribal fighters from east Ramadi and Ameriyat Al-Falluja finished their training in Habbaniya and Ameriyat and were armed. A member of Anbar GC says 1,000 volunteers will be trained for one month to join the Iraqi forces in the fight against Daesh. Sahwa Commander says 4 new brigades of total of 4,000 tribal fighters from Anbar were formed during the last few days. DaeshDaily Crosscheck: The MoD said yesterday only 500 fighters finished the training. Ameriyat Al-Falluja Police Commander says dozens of Daesh terrorists were killed by airstrikes on the Zoba’a area east of Falluja and the Al-Hasa area in Ameriyat. He said the airstrikes were based on precise intelligence information. The Commander also says Iraqi security forces tightened security procedures there, anticipating attacks from Daesh. He also says the security forces raided several areas searching for wanted suspects. A member of Ameriyat Al-Falluja District Council says Daesh shelled the town with 120 mm mortars, killing 6 civilians and injuring 10. He says Iraqi forces shelled the mortar positions and forced Daesh to retreat. Local sources say a woman and her 2 children were killed and other civilians injured when Iraqi forces shelled Al-Golan in north Falluja. A local source says Qarma District Council fired the mayor of Qarma and another local official because of “financial and administrative corruption” in the distribution of humanitarian aid for displaced people. A security source says the Iraqi Anti-Terrorism Force killed 7 Daesh terrorists and captured an armored vehicle and a truck loaded with weapons in Eastern Hsaiba near Ramadi. Iraqi MoD denies the media story about an Iraqi military helicopter going down in Saqlawiya north of Falluja. The Ministry accused the news sources of supporting terrorism. A tribal leader from Anbar told Rudaw TV that 3 Iraqi helicopters went down in different parts of Anbar. Daesh says it shot down two military aircrafts east of Ramadi. A source in Anbar Police Command says Iraqi security forces and PMFs cordoned off the Al-Thirthar area, preparing for a major attack on Ramadi. A source in Anbar Operations Command says Iraqi forces killed 3 Daesh terrorists trying to plant an IED on the road to Qarma. He also says Iraqi forces stopped an attack on a security barricade in Jubba near Haditha and killed 7 terrorists. Local sources say Daesh attacked Iraqi forces in the Subaihat area of Qarma, killing or injuring several Iraqi soldiers and destroying an armored vehicle, then retreated. Iraqi Joint Operations Command says Iraqi Army Aviation destroyed a car bomb factory in Malahma, east of Ramadi. Unconfirmed news that Jazeera Operations Commander sent a request to the MoD asking to release him from his duties because his troops suffer from the lack of military and food supplies. A Coalition Commander tells the Guardian newspaper that the former Anbar Operations Commander gave an order to his forces to withdraw from Ramadi without giving any reason, which allowed Daesh to capture the city. DaeshDaily comment: Daesh Daily reported this almost immediately after Ramadi fell. A member of Shirqat Notables Council says Daesh deployed Afghani snipers in the electricity stations in Shirqat, anticipating an attack by Iraqi forces. He also says more than 100 Daesh terrorists were killed in that area during the last 3 months by Coalition and Iraqi Air Force airstrikes. A security source says Iraqi Federal Police shelled Tal Abu Jarad near Baiji, killing 14 Daesh terrorists. However, Rudaw TV (Kurdish) reports that Daesh recaptured Tal Abu Jarad, killing 5 Iraqi Federal police members including a Lt. Colonel. Rudaw also says Daesh advanced to several areas inside Baiji. The MoI says Iraqi Federal Police killed 20 Daesh terrorists and destroyed 2 vehicles in Baiji in addition to stopping a car bomb coming from Siniyya. Daesh publishes photos of the results of the Coalition airstrikes on Siniyya. A security source says Samarra Operations Command, in coordination with Iraqi Army Aviation, destroyed 2 Humvee bombs near the Strategic Line west of Samarra. He also says Daesh launched an attack on the area but the Iraqi forces stopped the attack and killed 23 terrorists. A security source says an IED exploded in Tuz Khurmatu east of Tikrit, injuring 4 civilians. Salahuddin Governor issues an order for all government employees in Tikrit to report to their work; otherwise their salaries will be stopped. Badr Militia says it is sending more troops from Kerbala to the Al-Fatha area in Salahuddin to reinforce their troops there. The President of the PMFs Commission meets with the local officials and says the procedures for allowing the displaced people to return to their homes in Tikrit are “good and flexible”. Salahuddin GC Chairman says 500 are returning to Tikrit today. Local sources in Tikrit say life is going back to normal gradually and the Iraqi Federal Police and Iraqi Army in addition to local tribal fighters are holding the ground firmly. Photos of the displaced families returning to Tikrit. An MoI source says a car bomb exploded in Kadhimiya in north east Baghdad, killing 3 people and injuring 10. DaeshDaily Comment: This attack shows that “holding the ground” is not necessarily an effective strategy against Daesh. Kadhimiya is the holiest Shia area in Baghdad, and one of the holiest in the world. It is heavily guarded by all kinds of security forces and militias and the majority of its residents are Shia. That didn’t prevent Daesh, and AQI before that, from targeting it several times. Moreover, Daesh’s “ideology” is moving towards Baghdad every day. Recent Daesh videos show younger and more educated people from north Baghdad joining Daesh. These are not like the Daesh terrorists who graduated from Bucca Prison. If one out of ten young Sunni young men joins Daesh it could be disastrous. A security source says 12 Daesh terrorists were killed and several arrested in a raid by Iraqi forces on Al-Hora in Tarmiya in north Baghdad. A security source says an IED exploded, targeting a civilian car with 4 PMFs in it in Abu Ghraib, just west of Baghdad, killing 2 of them and injuring 2. A security source says 2 Iraqi soldiers were killed and 2 injured when an IED exploded on their patrol in Taji in north Baghdad. A security source says an IED exploded in Saidiya in west Baghdad, killing one civilian and injuring 5. The commander of Saraya Ashura’, a Shia militia, says his troops have started to armor their anti-IED vehicles in order to clear the liberated areas. A security source says 2 civilians were killed and 4 injured when an IED exploded near a hospital in Mada’en in south Baghdad. A report about Iraqi tribes (Sunni and Shia) training their young boys (10 years and older) to fight Daesh. The Spokesman of PM Abadi says the Iraqi government believes the efforts to stop foreign terrorists from coming to Iraqi are not enough and their numbers are not decreasing. A Shia MP says the calls to establish “Sumer Republic”, a Shia state, in Iraq are not appropriate. Many online Shia activists are calling for this “state,” reflecting their lack of trust and the disappointment with the current political system. An interview with an Iraqi Daesh leader. A security source says 3 civilians were killed and 7 injured when an IED exploded in Baladruz southeast of Baquba. A member of Diyala GC says 5,000 fighters from the governorate are fighting with the PMFs in Anbar and Salahuddin. A local official in Qara Tappa says 400 displaced families returned from the town to their houses in the liberated areas during the last two weeks. He says there are 1,700 displaced families in Qara Tappa. A security source says the Peshmerga found recently planted IEDs in Himrin Hills, Jalawla, and Qara Tappa, which indicates that Daesh is returning to some of the liberated areas. The Displacement Directorate in Kirkuk says 400 displaced families returned today to Salahuddin. They also says thousands more families will return during the month of Ramadan. 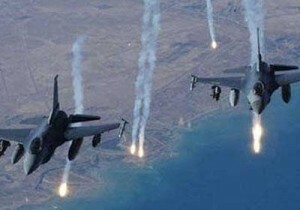 A security source says dozens of terrorists were killed in Coalition airstrikes on Daesh locations between Makhmur and Hawija west of the city of Kirkuk. An Iraqi Army source says the Daesh leader in Makhmur was killed during the airstrikes. A security source says the Coalition launched an airstrike on a Daesh weapons storehouse in Hammam Al-Aleel southeast of Mosul and destroyed it completely. A Kurdish source says the Peshmerga stopped a Daesh attack on Sinjar and killed 25 terrorists. He also says Daesh launched another attack on Makhmur district, southeast of Mosul, but the Peshmerga stopped the attack and killed 30 terrorists and destroyed dozens of their vehicles. Daesh publishes photos of their billboards and their pamphlet distribution in Mosul. And photos of Zakat distribution. And photos of services in Tal Afar. The Peshmerga say they destroyed 2 Daesh vehicles filled with Katyusha rockets in the Kassak area west of Mosul. A local source in Mosul says dozens of Daesh terrorists were killed in heavy airstrikes on Hamdaniya District south of Mosul. The source says one of the terrorists killed was a Syrian called Abu Aisha, responsible for executing Iraqi security officers. A Kurdish MP says Shia and Sunni MPs are gathering signatures to disband the Ninewa GC. No explanation was given. An Iraqi MP gave an explanation of why (according to him) former PM Maliki gave orders to the Iraqi forces to withdraw from Mosul in June last year. The former Ninewa Operations Commander says he got orders from Maliki to withdraw. Daesh Daily comment: This is of course not the explanation to date for the collapse of Mosul, and some in Ninewa have personal reasons to deflect blame from themselves. The report of the Mosul investigation committee looking into what happened has not yet been issued. A Sunni Imam from Ninewa says Daesh prohibited Taraweeh Prayers during Ramadan month. These prayers are traditional Sunni prayers held only during Ramadan all over the Sunni world. DaeshDaily Comment: Daesh allowed Taraweeh last year in Mosul. And some of its supporters published photos of Taraweeh this year. However, the news about the prevention is all over Arabic (not only Iraqi) main stream media. A PUK source says the Coalition launched airstrikes on a Daesh convoy in the rural Ba’aj district, killing 8 terrorists and injuring 4 in addition to destroying 4 vehicles, 2 Humvees and 2 construction shovels. The Director of Kidnapped Yazidis Affairs in the KRG says 1,850 Yazidi people have escaped Daesh prisons so far. He also criticized the central government and Ninewa local government for not providing any help for the kidnapped Yazidis. A KRG official says Daesh is forcing Yazidi prisoners to pray 5 times a day and fast during the month of Ramadan. A Yazidi girl tells her story and how she was kidnaped by Daesh. The Chairman of the Security Committee in Kerbala GC says PM Abadi ordered the road between Anbar and Kerbala closed to trucks after 8 car bombers were caught trying to enter Kerbala last Wednesday. An Italian Company (ABC) started a 100-day land survey to detect land mines and IEDs planted by Daesh in the Jurf Al-Sakhar area north of Babel. The area was previously under Daesh control and was one of the first to be liberated by Iraqi forces. Babel Police say the PMFs stopped a convoy of civilian cars from Mosul yesterday but let them go after lecturing them about the PMFs and the liberation of Mosul. Local activists on social media say that’s not true and the convoy was stopped by Asa’eb Ahl Al-Haq, who released the women and children and took the men to an unknown location. Local military sources say Kurdish forces liberated the countryside west of Tal Abyad completely from Daesh. The capture of Tal Abyad, on the Turkish border, by the Kurds and Free Syrian Army forces backed by US airstrikes, was a major story on international media. A report about the daily life in the Kurdish areas in Syria. And a report about the Kurdish Red Crescent activities there. Daesh publishes photos of capturing a cigarettes dealer in Raqqa. Daesh publishes a video of their “products quality control” in Deir Al-Zor. And photos of their terrorists in the same city. Training courses for former Syrian regime’s soldiers. Daesh publishes a video of a suicide attack on the Kurdish forces in Kobani. Daesh says it shot down a Coalition military aircraft in Kobani. Daesh publishes photos of detonating Syrian bases on the international road between Damascus and Baghdad. Daesh instructions for their terrorists and a special order not to publish photos of female “slaves” in Syria. Reports about Daesh selling women from north Aleppo. Egyptian ministry of interior says a policeman was killed and 3 injured when an IED exploded on their patrol in Areesh in Sinai. Daesh publishes a video of executions in Afghanistan. Daesh physicist talks about laser rockets. And denies the existence of the nuclear bomb. Jazeera Operations Commander says his troops, supported by tribal fighters, implemented a successful military operation to cut Daesh supply lines between Al-Qa’im and Kubaisa in west Anbar, killing 10 Daesh terrorists and destroying 4 vehicles. A security source says the Daesh wali (governor) in Hit, a Saudi called Abu Talha, was killed on Tuesday morning by unknown armed men using guns with silencers. The source says this assassination is the first of its kind to infiltrate Daesh in Hit. Iraqi MoI says 34 Daesh members were killed and many injured in two Iraqi Air Force strikes on a Daesh training camp in Hit. The Ministry says the airstrikes were coordinated among the Joint Forces, MoI’s Al-Suqour Intelligence Cell, and the Iraqi Air Force. The ministry says several Daesh leaders were killed in the airstrikes. This is the third military operation organized by Al-Suqour Cell in Anbar during the last 3 days. The Spokesman of the PMFs says opening a secure path for the civilians to leave Falluja is the reason behind delaying the military operation to liberate the city. He denies reports there are disputes between the PMFs and PM Abadi about Falluja. Some news sources say Abadi is under huge pressure not to let the PMFs participate in Anbar liberation battles. DaeshDaily Crosscheck: As noted in earlier DaeshDaily reports, however, the outside PMFs were sent in after Anbar officials overcame their reluctance and openly requested that the government get their help to remove Daesh. The MoD says the Iraqi Air Force launched airstrikes on 4 Daesh locations near Khaldiya, killing 10 terrorists The IAF also bombed Daesh in the Al-Falahat area, killing 6, and a Daesh location in Husseiniya near Hit. The MoD also says Jazeera Operations Command spotted two Daesh groups near Majed checkpoint and gave their information to the Coalition, who bombed them and killed 30 terrorists. The MoI says Iraqi Air Force launched airstrikes on Daesh in Falluja killing 30 terrorists. DaeshDaily Opinion: This news didn’t appear on the MoD’s website, which shows the confusion inside the Iraqi establishment regarding the media coverage, and perhaps the management of the military operations too. The MoD says Iraqi forces killed 8 Daesh terrorists, and destroyed 2 car bombs and captured 3 other vehicles, in Qarma. Local sources say a Daesh terrorist in a car bomb attacked an Iraqi Army checkpoint in Qarma, killing 4 soldiers and injuring 4 others. The Iraqi Minister of Defense visits Haditha and Jazeera Operations Command and meets with the military and tribal leaders there. He ordered more humanitarian supplies for the citizens of Haditha, who have been besieged by Daesh for months now. A member of Anbar GC says Daesh looted Ramadi Museum and started to sell the stolen archeological and historical pieces to specialized dealers. He also says Daesh has its own “archeology experts” who have vast knowledge of the international smuggling market. The MoD says 500 tribal fighters from Ameriyat Al-Falluja graduated from their training camp in Habbaniya. The Ministry says this is the first groups out of 2,500 local volunteers being trained by Iraqi MoI officers under the supervision of the MoD and in coordination with the Coalition. Local sources say Daesh shelled Ameriyat Al-Falluja with rockets and mortars killing 5 police officers and injuring 6. A member of Anbar GC says the Ramadi liberation battles haven’t seen any advances yet and that has given Daesh time to reinforce its positions there. He also criticized the Coalition’s airstrikes, saying their role is “weak and below the required efforts”. DaeshDaily Opinion: Many Iraqis we talked to recently, especially in the Iraqi armed forces, showed the same dissatisfaction with the Coalition’s role. Some say Iraqi intelligence is providing the Coalition with information and GPS locations but the response from the Coalition is very slow, if it comes at all. In addition, the accusations about the Coalition accidentally dropping supplies to Daesh in several areas continue and we don’t see efforts to encounter these accusations effectively. However, some people we talked to praised the Australian Air Force, saying they are more accurate in their airstrikes. Daesh publishes photos of their rocket attack in Anbar. Daesh publishes a video of executing a man accusing him of murder. Daesh says a suicide bomber attacked Iraqi forces in south Qarma with a car bomb and stopped their attempts to advance in the area. Daesh also says a booby-trapped house exploded on the Iraqi forces in the same area. Daesh publishes photos of their attack on the Iraqi forces in Zobaa’ area. Daesh publishes photos of pamphlet distribution in Anbar. (The same pamphlets about fasting in Ramadhan month in Diyala). Iraqi Federal Police Commander says Police Commandos launched a major attack on Daesh in the Tal Abu Jarad area near Baiji, killing 14 Daesh terrorists and capturing 2 Humvees. He also says the Commandos attacked Daesh in Al-Fatha, killing 8 terrorists including 3 snipers. Local sources say 25 Iraqi soldiers were killed or injured in the continuous clashes in Tal Abu Jarad. The Spokesman of the PMFs says the PMFs are clearing Baiji of IEDs and have surrounded Daesh snipers in the city. He also says Iraqi forces are preparing to attack Siniyya from several sides. The MoD says Iraqi Army Aviation bombed a Daesh gathering near Ajeel oil field, killing 20 terrorists and destroying one vehicle. The Ministry also says IAA destroyed a Humvee bomb and 2 other vehicles in Siniyya. The MoI says Samarra Operations Command secured the return of 100 displaced families to Tikrit after clearing their area of IEDs and setting up basic services. A police source says armed men in two pickups kidnapped the director of the electricity department in Talbiya in east Baghdad from his office. A security source says 1 civilian was killed and 10 injured when an IED exploded near a grocery market in Ameriya west of Baghdad. A security source says an IED exploded near a sheep market in Latifiya south of Baghdad, injuring 8 civilians. A security source says 2 civilians were killed and 8 injured when an IED exploded in Hay Al-Turath in south Baghdad. Iraqi Council of Ministers approves the General Amnesty Law draft and will send it to the Parliament in the next two days. Many (Shia) politicians expressed their concerns that the law might let some terrorists out although PM Abadi assured them the amnesty will not cover several crimes, especially terrorism. On the other side, Sunni politicians said the draft was emptied of its intended impact and does not address the real problems of (Sunni) people who were arrested unjustifiably on terrorism accusations. DaeshDaily Opinion: It is not a coincidence that terrorist activities increase after every amnesty. For example, two months ago amnesty was given by PM Abadi to local police who left their posts when Daesh captured several Anbar cities last year. Ramadi fell immediately after the amnesty, when apparently the same police officers left their positions and let Daesh terrorists enter the city without a fight. This is not to say Iraq doesn’t need a general amnesty, but amnesty should be given as part of a national reconciliation process that addresses the grievances and the concerns of all Iraqis. An amnesty should be directed to people who were accused but innocent. Iraq’s amnesties often release people who have blood on their hands but have the right political or tribal connections. Many current Daesh leaders were in prisons and then released for no good reason. For example, the terrorist confessing in one video is now a Daesh leader in Mosul and appeared in a recent video leading a tribal gathering. His confession in the first video was obviously under threat, but that doesn’t mean he was not affiliated with Daesh at that time. A popular hashtag on twitter about executing 7,000 Sunni Iraqis. The MoI says a special Iraqi security force operation in Himrin Hills killed a Daesh leader and captured two of his associates. Daesh publishes photos of their training in Qara Tappa. A security source says Coalition airstrikes killed 35 Daesh terrorists and destroyed 9 vehicles and a weapon storehouse in Dibis District, 45 km northwest of Kirkuk. The source also says the Coalition launched airstrikes on several areas in Hawija, 55 km southwest of Kirkuk, killing 10 Daesh terrorists and injuring 22. Daesh publishes new photos of one of the top Kurdish terrorists, Mullah Shwan, in Kirkuk. A security source says an Iraqi Air Force airstrike on a Daesh gathering in a house southwest of Mosul killed or injured 20 of them. Daesh publishes photos of road services in Mosul. And water project in Hatra. A security source says Asa’eb Ahl Al-Haq kidnapped dozens of citizens from Mosul in north Babel province. The source says Daesh allowed some people from Mosul to leave in order to get their salaries but they were captured by AAH, who separated the men from the women and led the men to an unknown location. A Kurdish official says the YPG will withdraw from Tal Abyadh after the security situation improves in the city. Daesh cuts the oil supply lines on north Syria. Daesh executes an Iraqi leader in Al-Nusra in Aleppo. Daesh publishes photos of their training camp in Hama. Daesh publishes photos of beheading a fighter from Jaish Al-Islam. Daesh publishes photos of another public execution in Deir Al-Zor. And destroying more graves in the same city. Daesh publishes a video of their intervention between two tribes in Homs. Daesh publishes a video of the fights in Muhassa area. A court in Mauritania sentences 3 men to prison for joining Daesh. Libyan authorities say they recaptured 2 areas in west Derna from Daesh. Eyewitnesses say Al-Qaeda in Yemen executed 2 men in Mukalla in the south, accusing them of giving information for the American drone attack that killed an Al-Qaeda leader in Yemen. Daesh claims responsibility for the 4 car bombs on Shia mosques in Sana’ in Yemen. Daesh publication about the Zakat (Islamic tax). It also includes some of their terrorist attacks. Daesh publishes a video of a “potential” suicide bomber in Sinai. Daesh publishes photos of beheading a “spy” in Afghanistan.